We said a sad farewell to the Penzion Mayer, with its beautiful tiled bathroom, generous and fresh breakfast and prime location. The manager, when Alison asked him to book us a taxi to the bus station, offered to drive us there gratis. So nice! We ended up taking a car and driver to the city instead of the bus to save time. The driver was quite a character, complaining all the way that he was losing money on us since he could only get five passengers. At any rate, it was a quick trip to the city, we rolled our suitcases to the hotel, and here we are. Well! 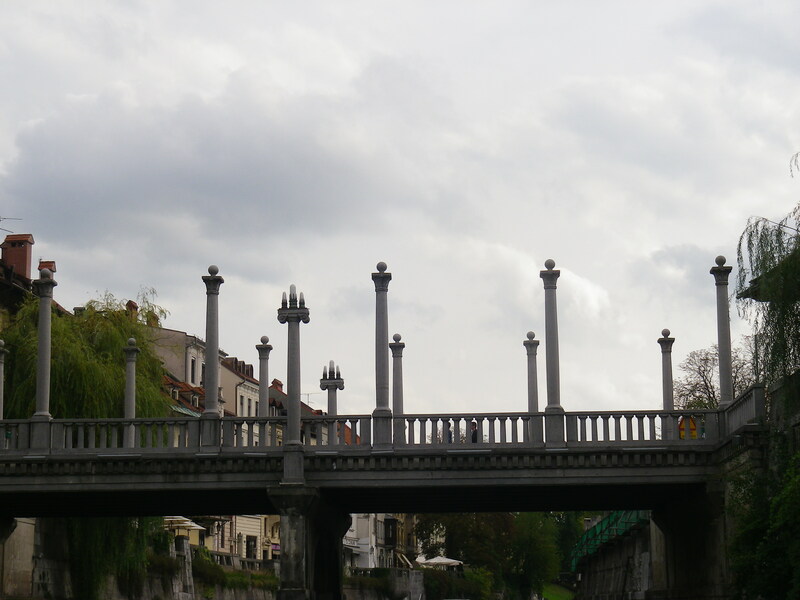 We chose this hotel for its location, which is perfect, right off the main square in Ljubljana with the cathedral and the famous triple bridge. Never mind that the bathroom is not only tiny but designed so that you can hardly help but spray the shower all over the place, and there is nowhere to put the soap. It does, on request, have both a good hair dryer (which eventually worked once the nice man fixed the fuse) and laundry facilities that we used this afternoon. Never mind that it was gloomy and sprinkling when we arrived and that we were both so tired we had to crawl back to the room for a long afternoon nap. Things looked up after that. I find that a gentle boat ride down the river is just the ticket when you’re feeling weak. 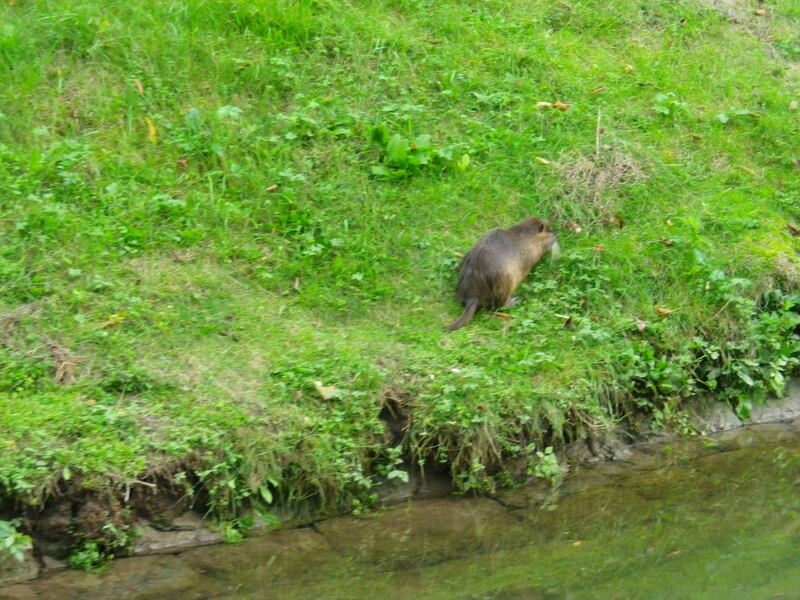 We watched the kids kayaking and a creature that the captain called a beaver but made me think more of a marmot chomping grass, while the banks slid slowly by and we waved at people standing on the bridges. 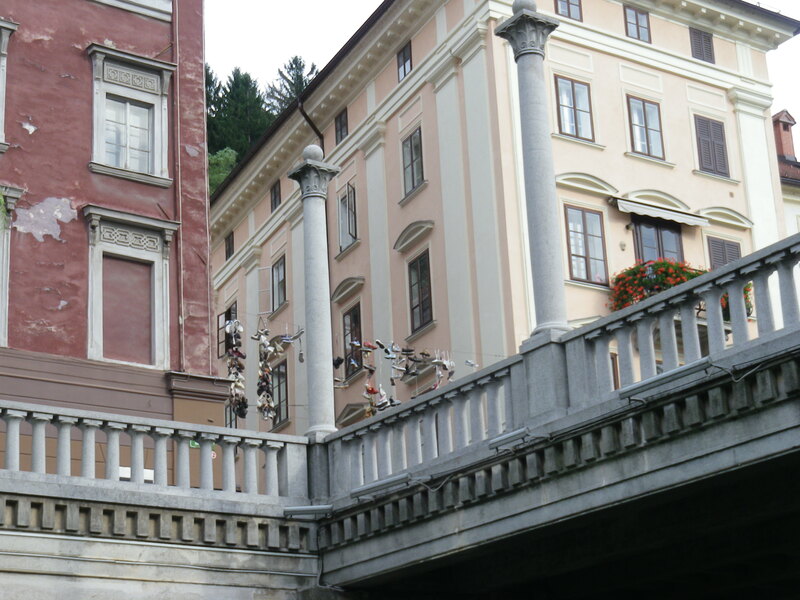 This is the Cobbler’s Bridge by the ubiquitous and beloved Slovenian architect Jozef Pleznik, with a new feature at one end, shoes strung over a line. Soon after that it was time for dinner in the old town. 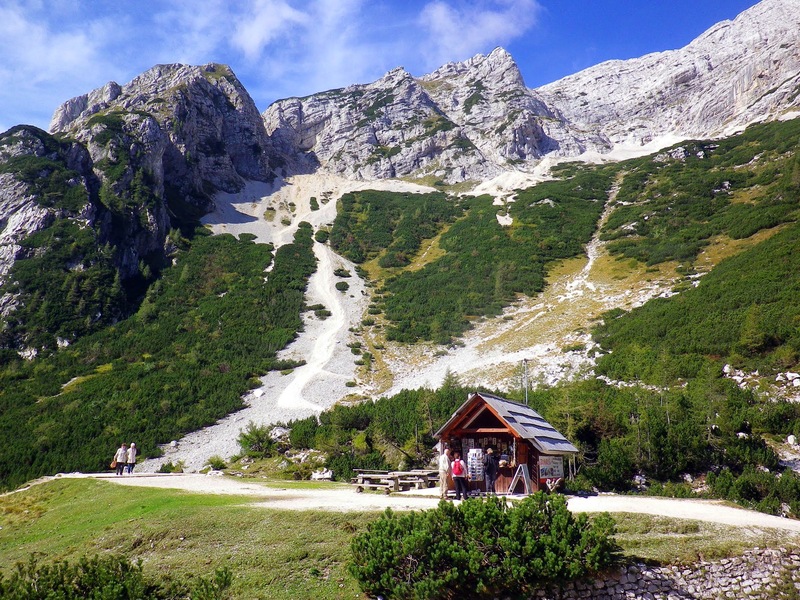 We went to Sokol, touted as having local Slovenian dishes. True, but they were indifferently presented and the venison goulash could have been any kind of meat. (They did offer foal on the menu – not kidding- but I feel sure we would have noticed…right?) So a bit of a bust, but that’s okay. We sat at the end of the Triple Bridge and watched the world go by until we decided it was late enough by our lights to call it a day. Today, as is usually the case, went much better (despite the tiny shower and the simple yet not delicious breakfast). We took a walking tour of the city with an enthusiastic graduate student who claimed she learned her fluent, idiomatic English by staying glued to the Cartoon Channel as a child. 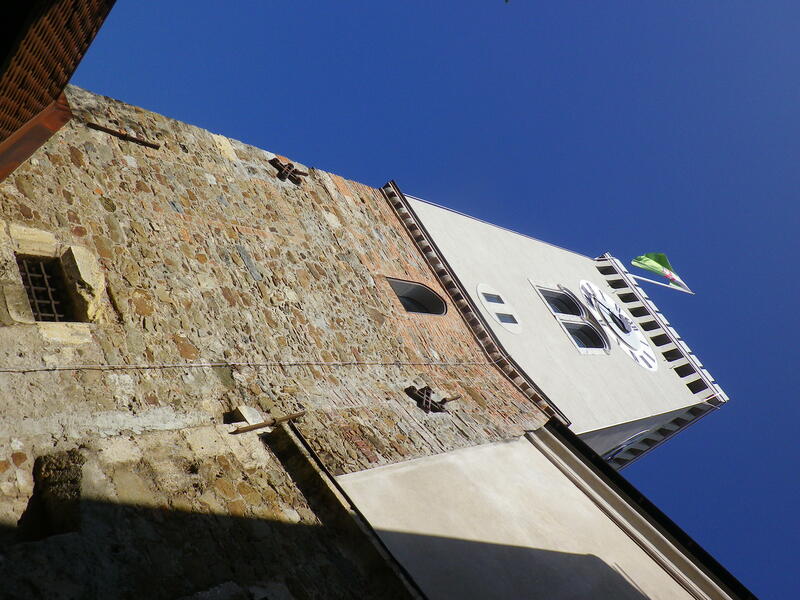 She was a good storyteller and kept us engaged as we looked at the cathedral (baroque interior), the town hall (16th century sgraffito), and the views from the top of the castle tower looking over the city to the Julian Alps in the distance. 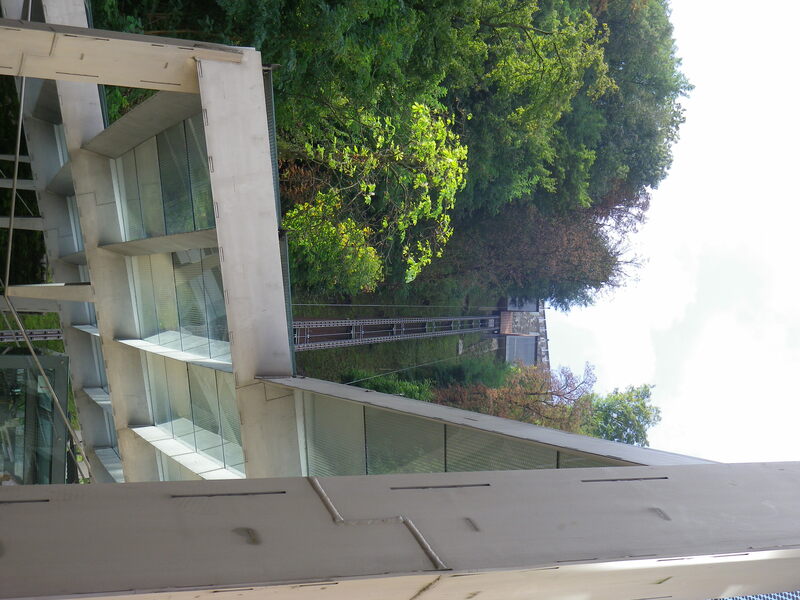 Did I mention that we took a funicular up to the castle? We shut our eyes and it was over in a moment. 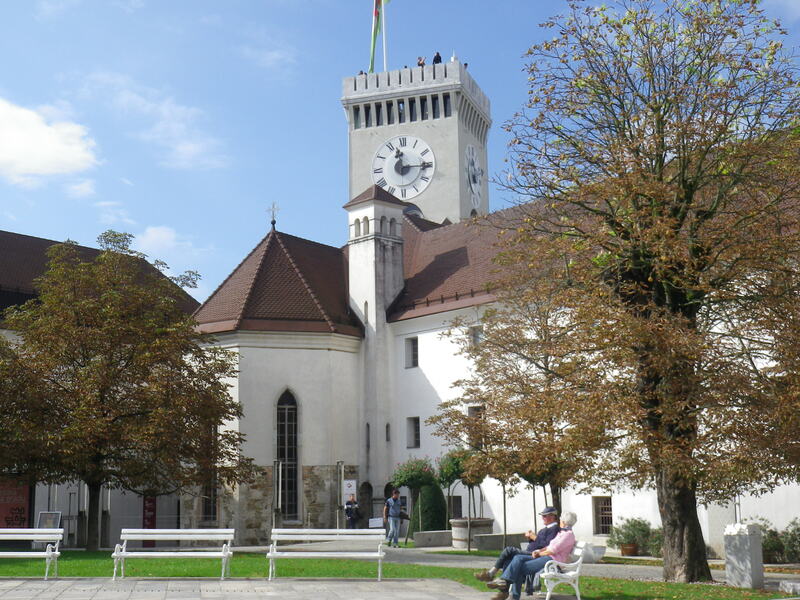 We had a really good lunch (Kranskje sausages with horseradish and potatoes) at the castle restaurant sitting outside in the square and then visited the Slovenian History Museum in hopes of getting a better handle on WWI in Yugoslavia. 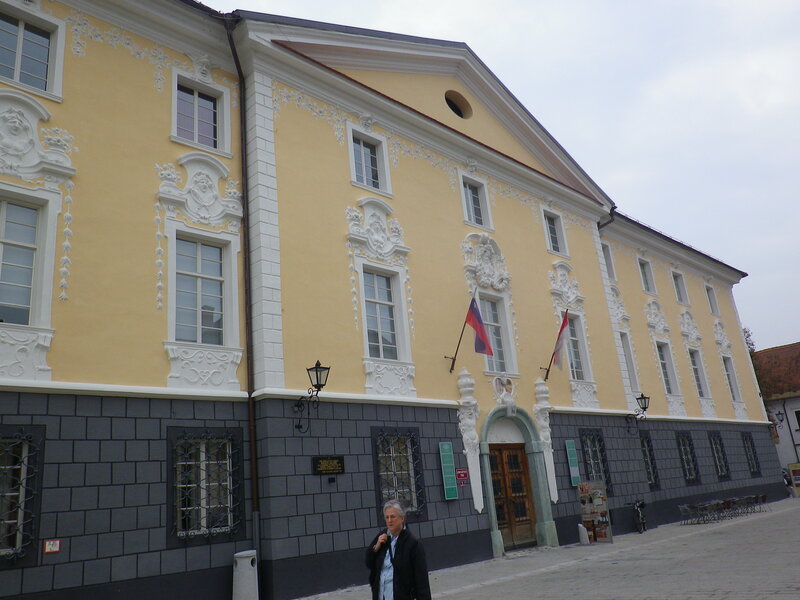 The museum was well arranged, but the most interesting thing was that Tito was barely mentioned – odd, considering that he WAS Yugoslavia for 40+ years and was apparently fairly well regarded by the people. 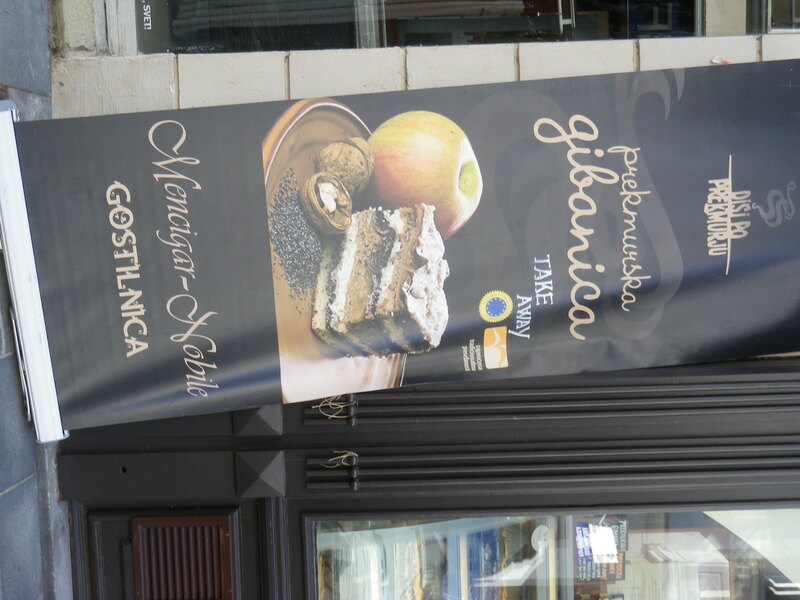 As a reward for our hard work, we descended via funicular to the old town for a piece of traditional cake made with apples, walnuts and poppy seeds. 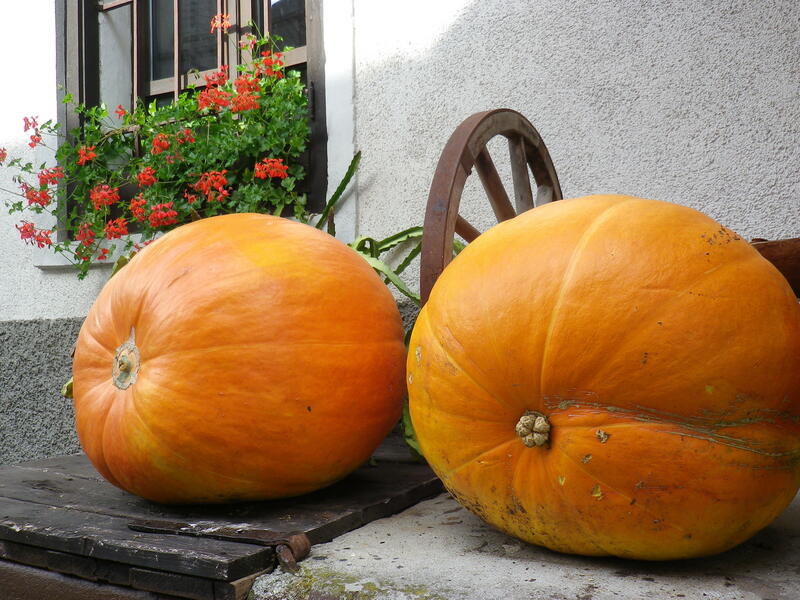 Quite delicious – our guide told us it’s complicated to make, so their family always buys it for special occasions. By 3:00, we were beginning to fade again, so it’s back to the room to do some laundry, read and nap until it’s time for dinner. A cool, cloudy day today. 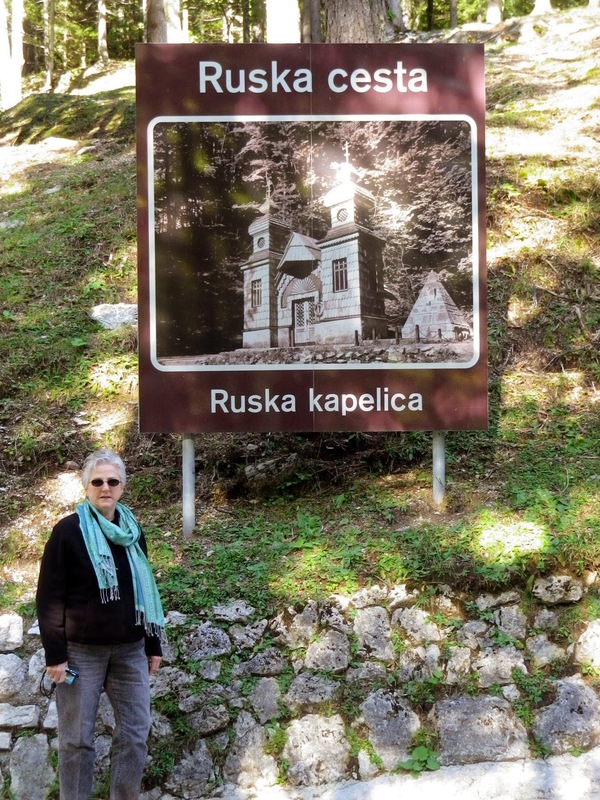 We headed for Radovlijca, a nearby village that is home to the Apicultural Museum, housed in a beautiful 16th century building. 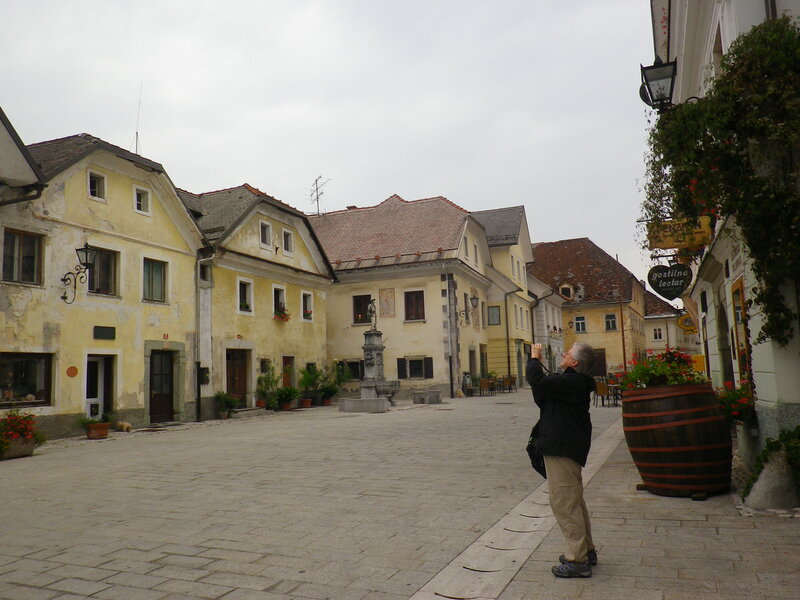 The main square is charming. We saw a few men drinking beer outside at 10:00 in the morning on a Sunday – must be a ritual. We stopped briefly in the gingerbread store/museum, then on to the bees. 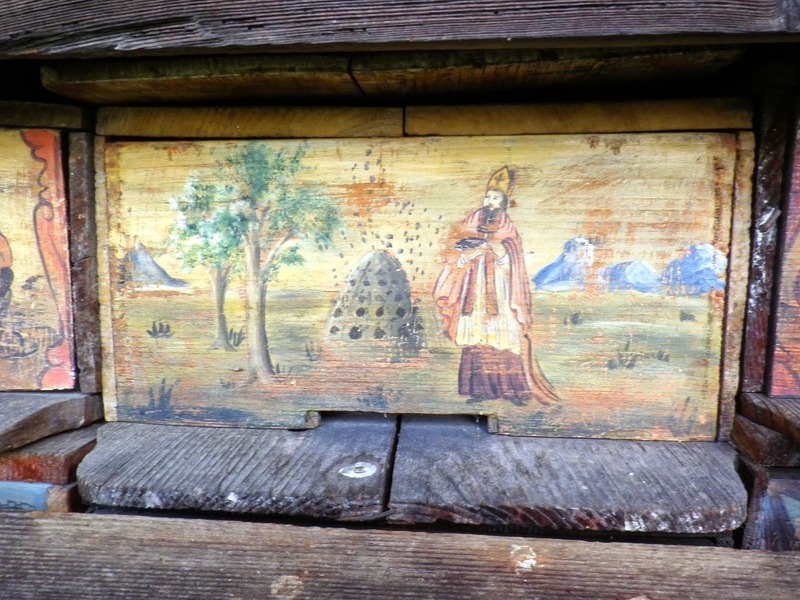 Because Tina had taken us to a local village where the father of beekeeping lived, we were already familiar with the tradition of bee panels. They were first designed in the 18th century as unique images that would help the bees find their way home to the hives. 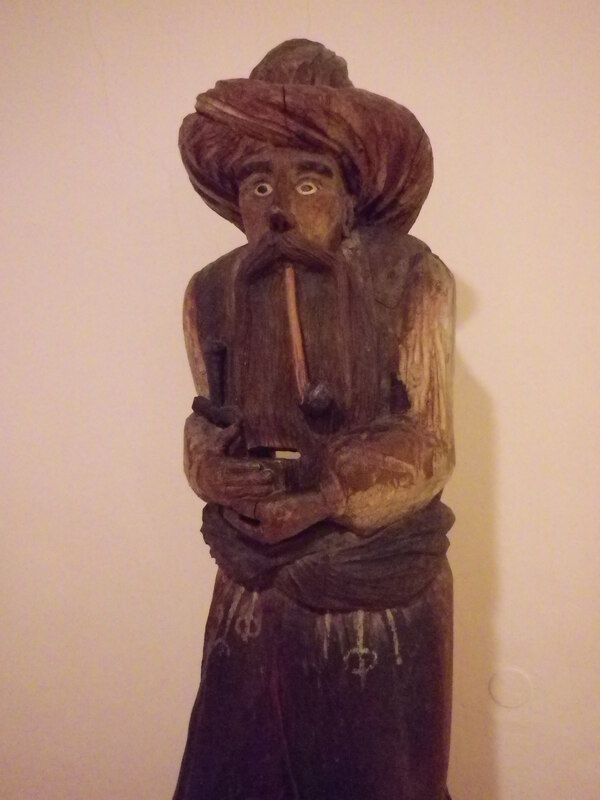 Here we saw a big collection of them, some with religious themes, others humorous, like this one. 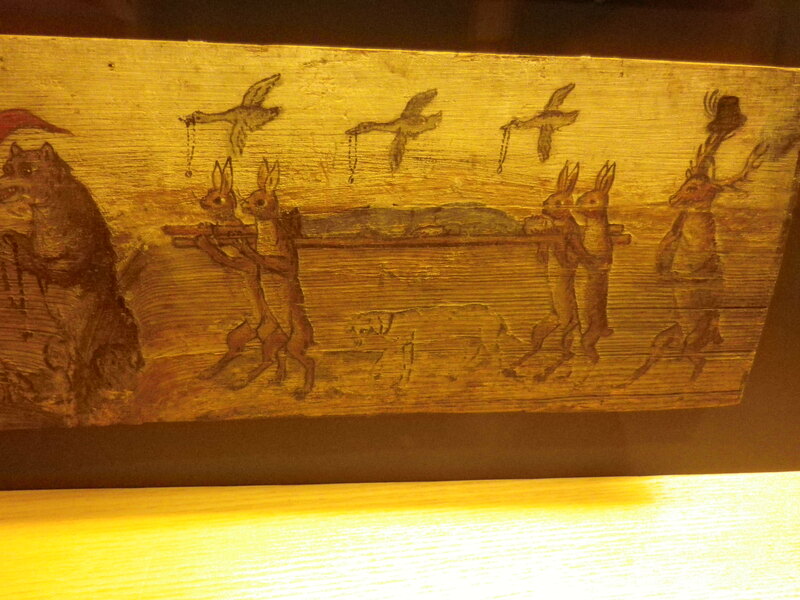 (Notice that at the hunter’s funeral, all the animals are rejoicing, except for the dog.) These statues, made to mimic Napoleonic or Ottoman soldiers, were sometimes mounted near the hives to protect them. 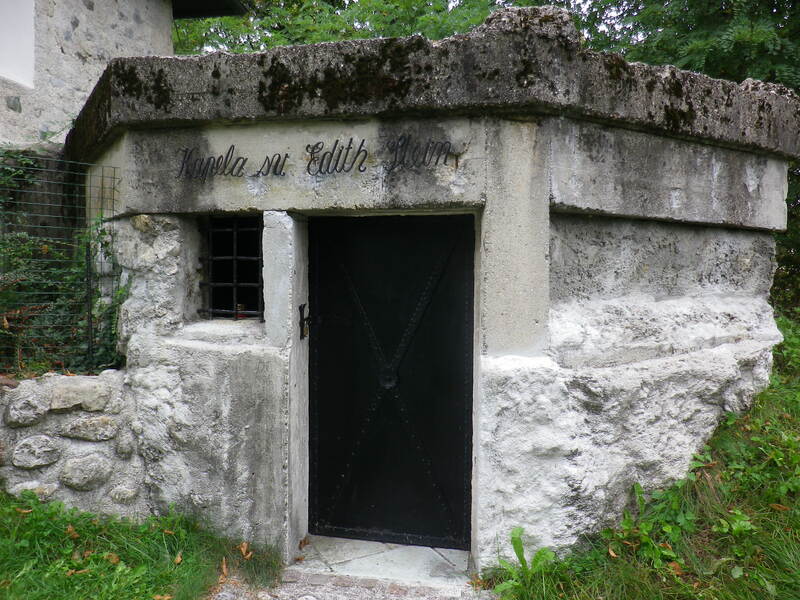 We wandered towards the church and behind it to a WW II bunker that is now a memorial to Edith Stein, a Jew who became a Carmelite nun and was killed at Auschwitz. As we rounded the church, the congregation came out and slowly left on foot, by bike or by car, chatting with each other as they departed. In search of sandwiches for lunch, we came to a cafe and bought the mysterious toast sandwiches we see advertised everywhere. They turned out to be toasted ham and cheese, so warm and good that we ate them on a bench outside. 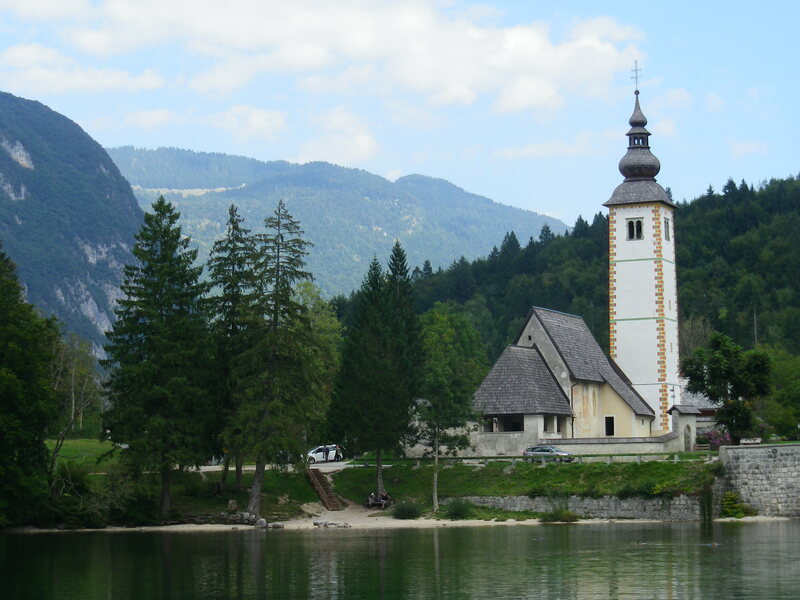 Back into Bled and on to Lake Bohinj, another tourist spot that is more outdoorsy and less crowded than Bled. 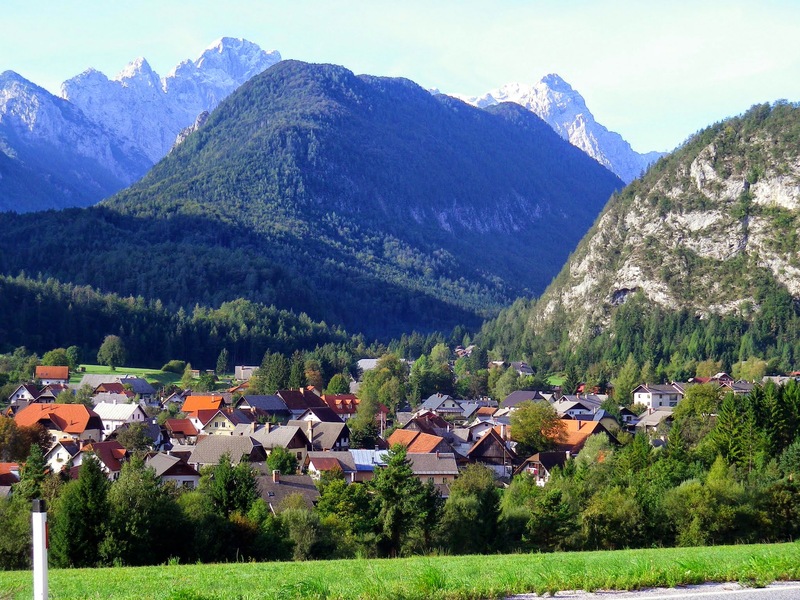 (Bohinj is pronounced with a chewy H and the j is silent, if that helps.) 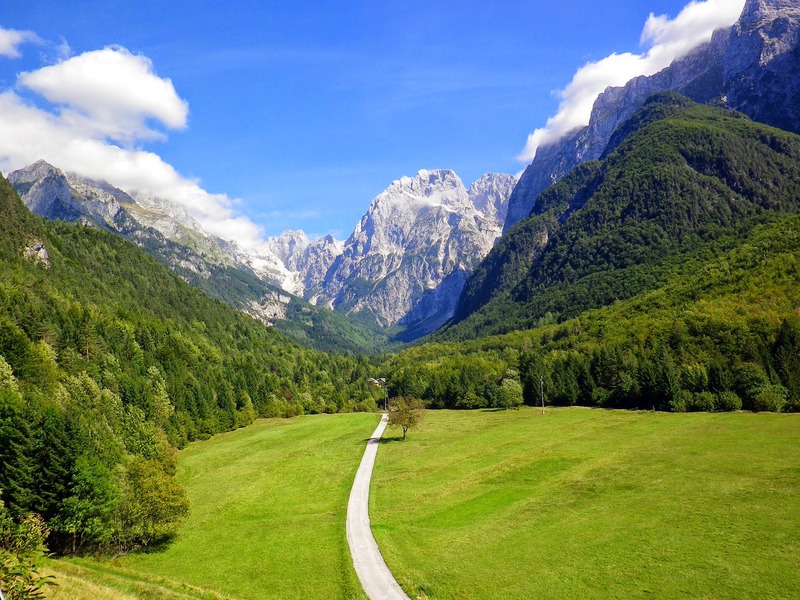 We followed the road along the lake, a very impressive sight with the mountains plunging down to the water, and then along a twisty little road, farther and farther, until at last we came to the end of the road and the trailhead for Slap Savica, the Slavica Waterfall. 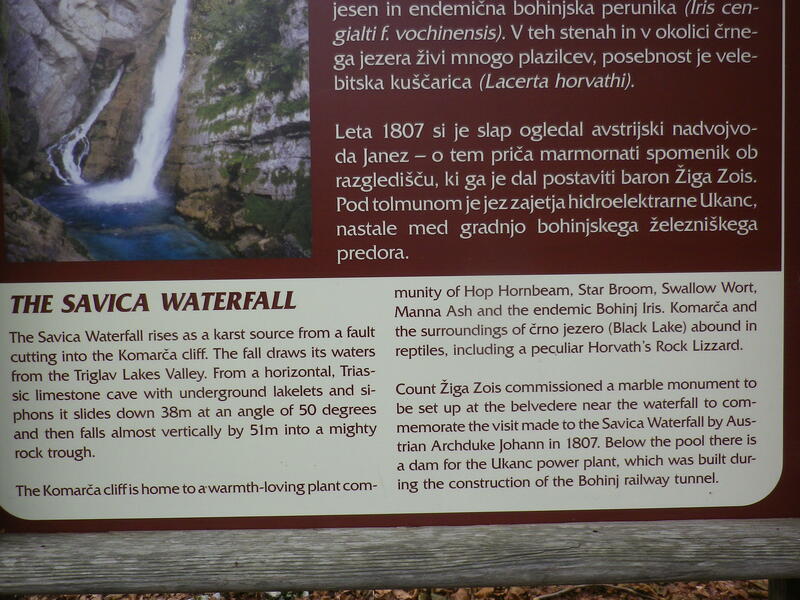 Rick Steves says there are 588 (or some such number) steps to the waterfall, so one of us was a bit apprehensive. But we took it slowly and made our way up there sooner than we expected. 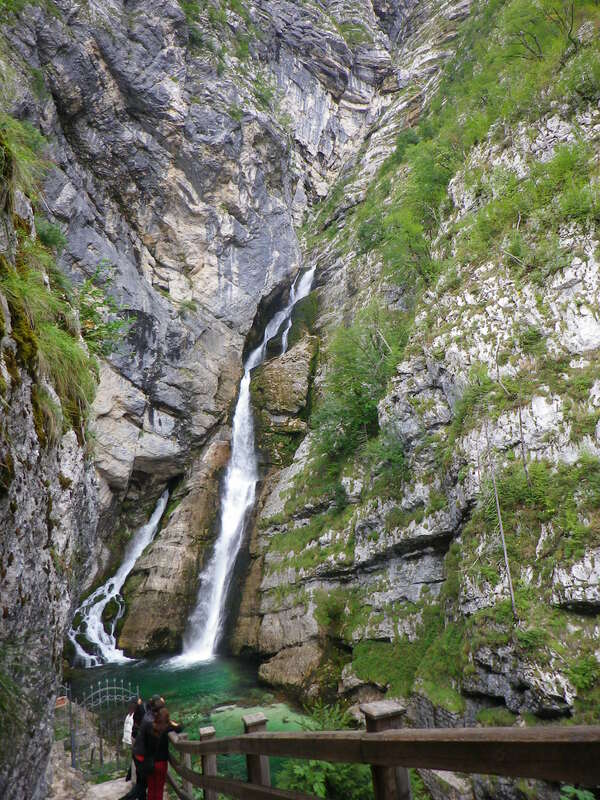 It’s a good waterfall, notable mainly for the way it springs out of the rock halfway down the mountain – that karst, you know, with its vanishing and reappearing rivers, lakes and waterfalls. After taking pictures for others and in turn having pictures taken for us, we came back down and drove back to the lake. Time for tea and cake! 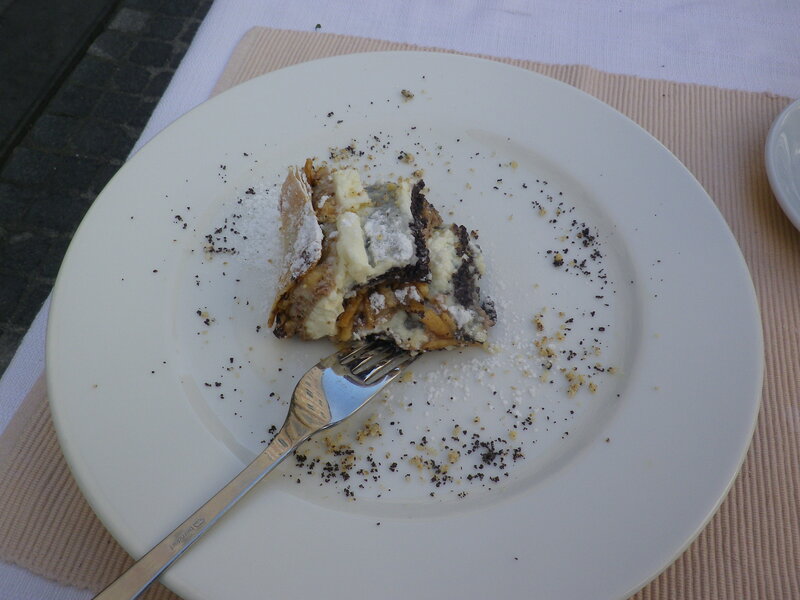 We still have not had the famous Bled cream cake – this one was called Marlenka and featured honey and nuts, yum. We ate it in a little place smack up against a sheer rock face, which one intrepid tourist tried to climb, though not for long. 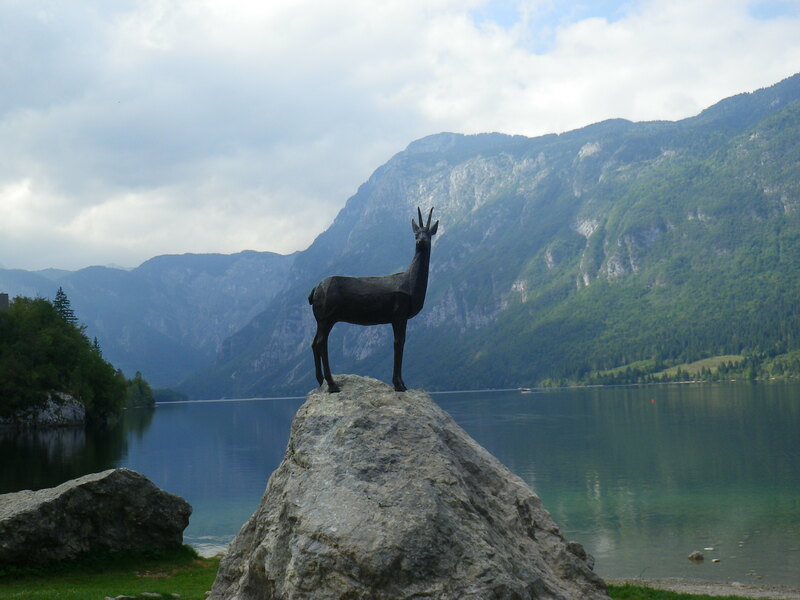 A few more pictures of the lake, the photogenic church, and the emblematic Zlatorog (kin to the one we saw in the Julian Alps), and we went idly in search of the Alpine Dairy Museum. 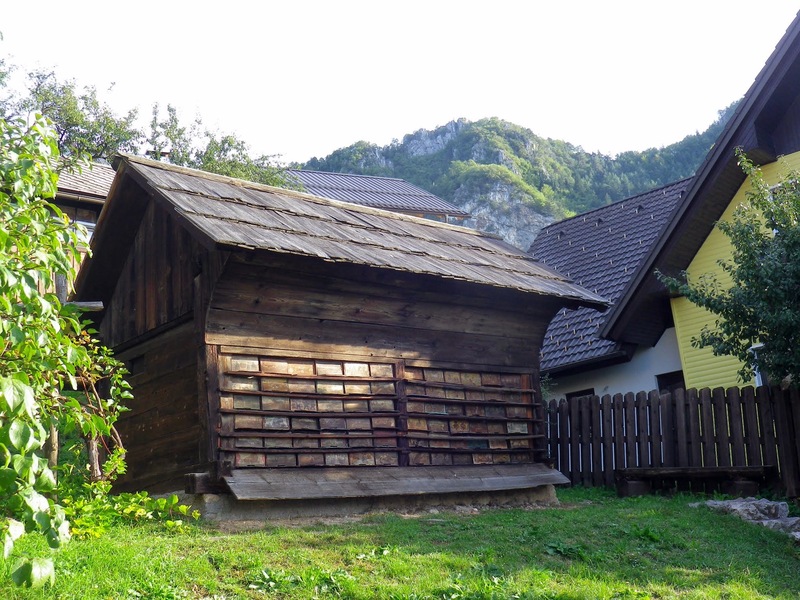 We found the right village, Stara Fuzina, but didn’t immediately see the museum, so we parked and looked around. This is the advantage of having a car – just follow your nose and see what you find. 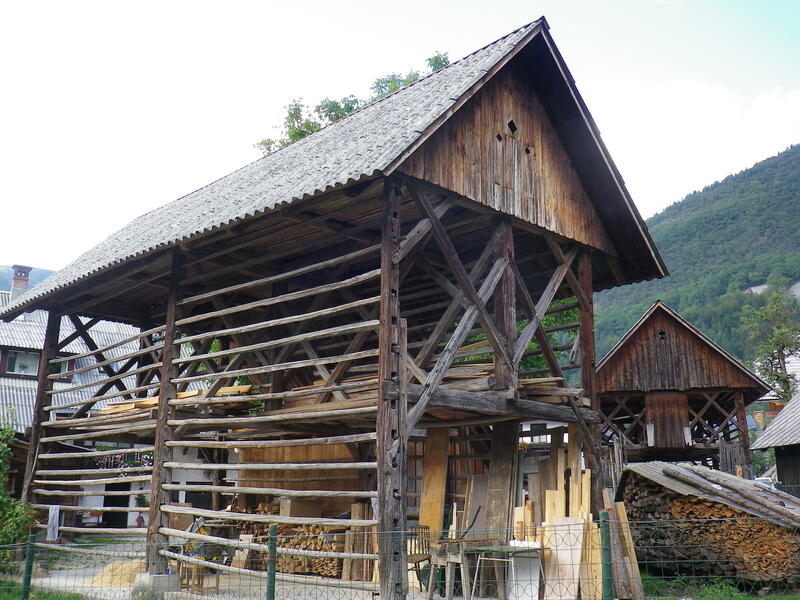 Everywhere you see either hay racks – this one still with hay drying on it – and these two-story sheds. 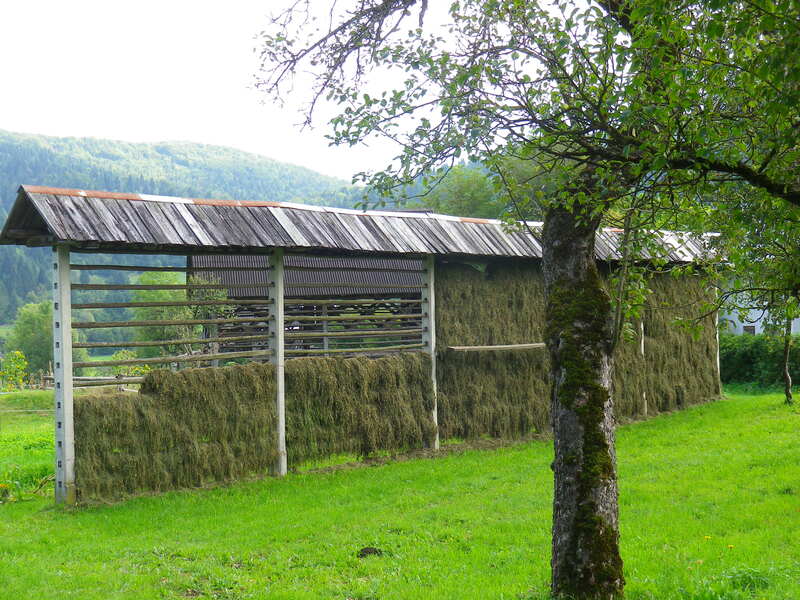 The walls are for drying hay, underneath there is usually some lumber stacked up, and above are various implements. Some children were playing on the upper floor of one of them. 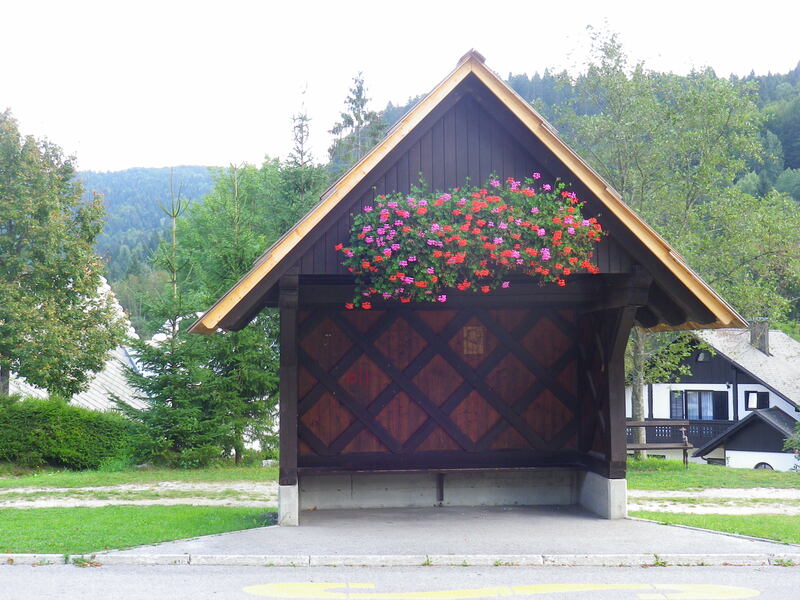 We liked the gardens everywhere, even at the bus stop shelters, every one with an overflowing container of geraniums like this one. 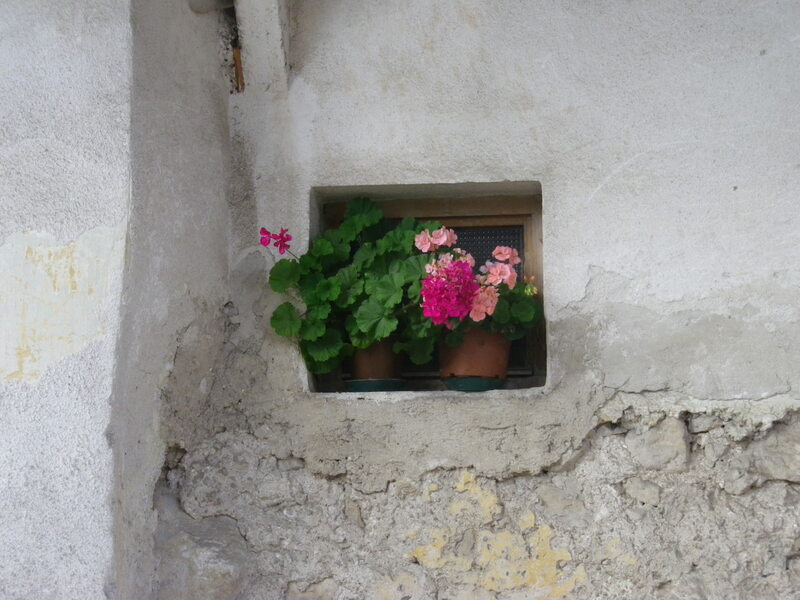 These geraniums in the window were too beautiful to resist. And we couldn’t help taking pictures of the icons. 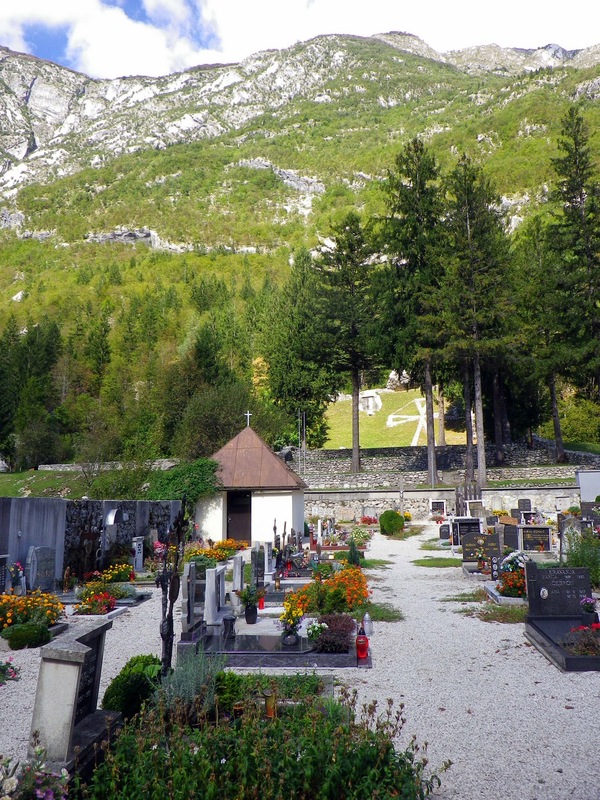 Tina told us that three-quarters of the population here is Catholic but only a very small number are active church-goers. 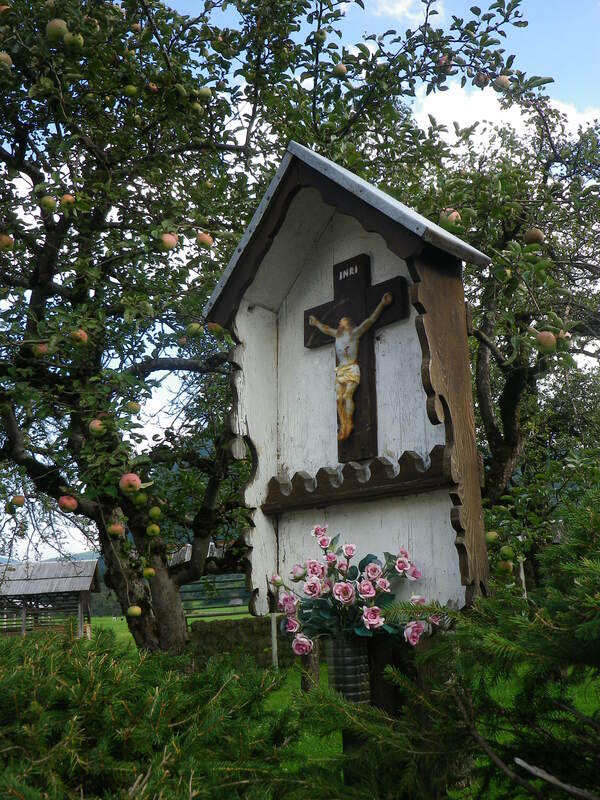 Nevertheless, these little shrines are everywhere – you never know when you’re going to run into Jesus as you travel about. We did find the museum at last and had a wonderful conversation with a woman washing her car nearby. Trying to determine whether it was the Alpine Museum or some other place, I kept saying “kuhe” meaning cow, since lots of people here understand German, while she kept telling us in Slovenian that the museum was closed until 4:00, finally pointing to my watch and tapping the number to make sure we understood. Oh, well – Google translate later helped us to know it had indeed been the dairy museum, but we will have to visit it another time. 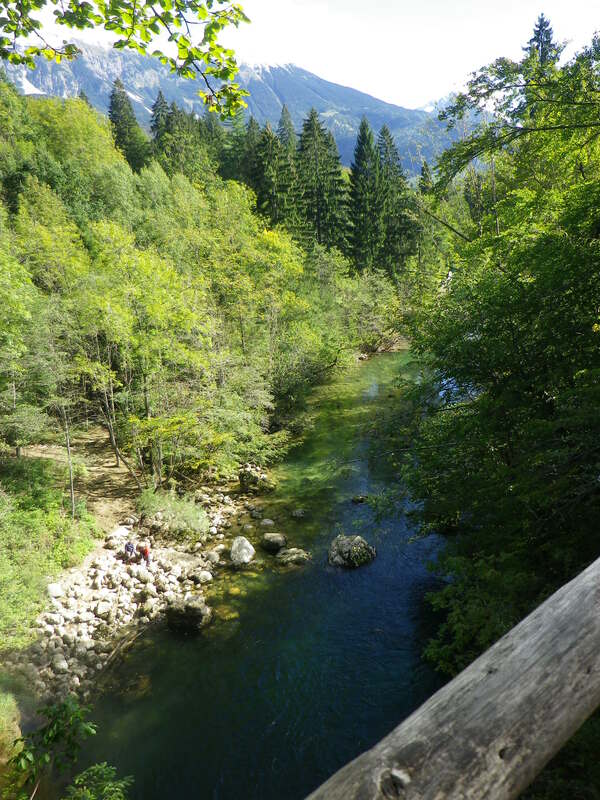 An uneventful trip back to Bled,where we parked the car for the last time, returned the rented hiking poles, and had our last glass of wine on the balcony. Dinner back at the first place we went, very nice despite a big crowd of loud Brits. And so to bed. Today was the test of whether I could still drive a stick shift after all these years. The nice young man delivered a slightly battered Volvo to the Mayer and, after almost 45 minutes of paperwork, he reminded me of the shift pattern and left us. Fortunately, the Volvo shifts smoothly, and we encountered no hills on our unexpected route. This was the most touristy thing we’ve done so far but it was totally worth it. 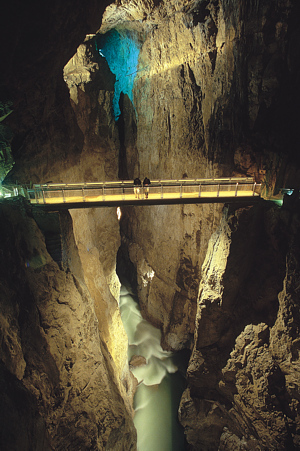 The caves are the number one tourist attraction in Slovenia, which means lots of hype and enormous crowds in the high season – busy enough today but it was bearable. 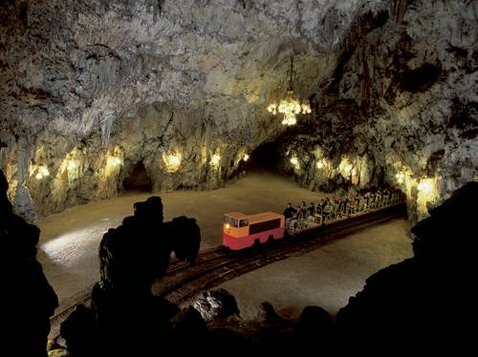 You enter and take a seat on the open electric train, which then whisks you through the cave for about ten minutes. 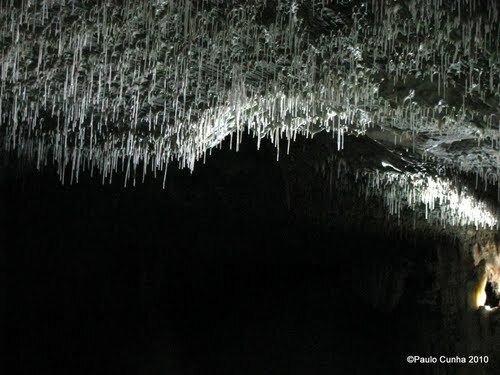 It’s truly amazing – enormous stalagmites and stalactites, illuminated dramatically, while we kept ducking our heads as the roof of the cave swooped down on us. 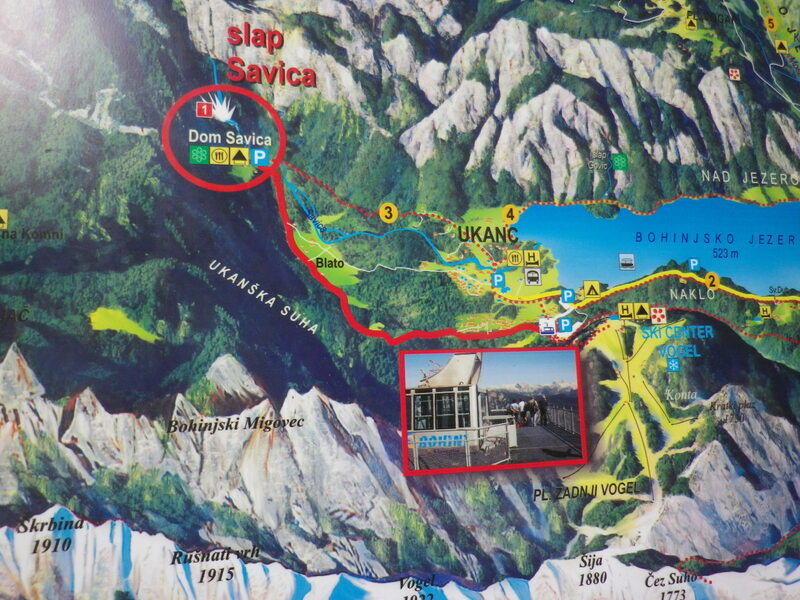 The train stops, you walk over to where your language group is indicated, and a live guide takes over. all we could do was look around in amazement. 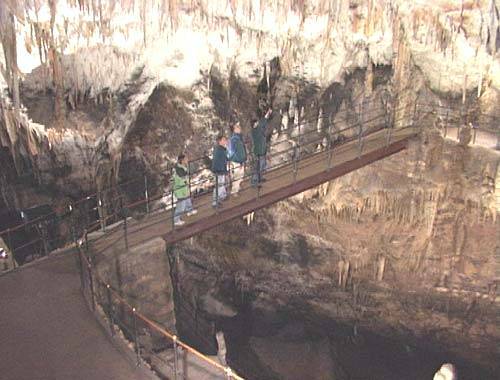 At one point the lights went out and of course it was absolutely black, pitch dark – a reminder of the three million years while the cave slowly developed, unknown to any humans and never illuminated. Then a final train ride back to the entrance, where we could (but didn’t) pick up one of the pictures they took of us as we started off on the train. We took a few pictures, but it’s hard to get good ones and most of the way photos were forbidden, so those above are from the web. 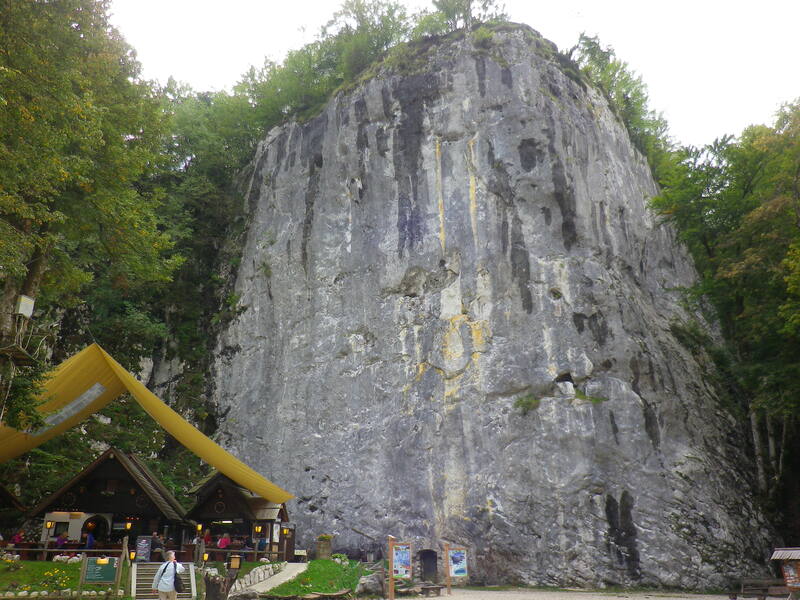 Although the Skocjan caves are a World Heritage Site and less visited, we chose Postojna because it is much less scary. 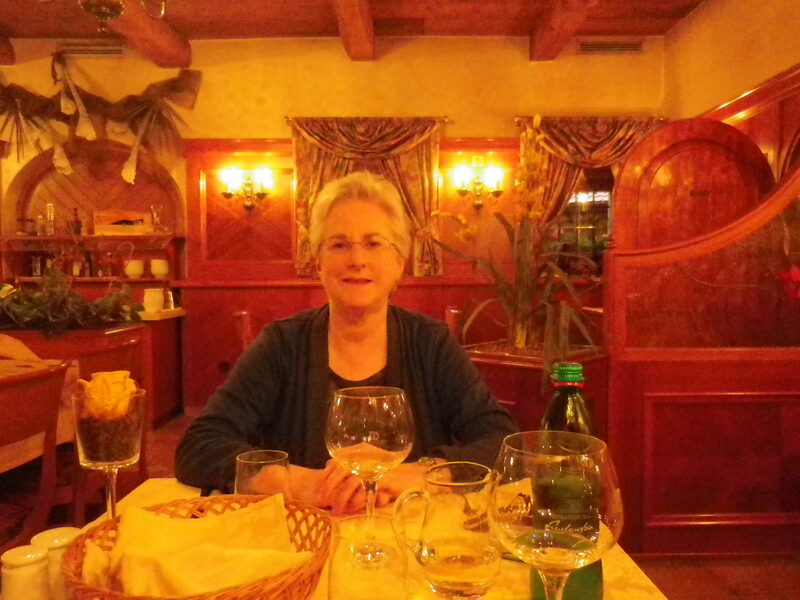 Tina, hearing our plans, said firmly that Alison could not go to Skocjan (and neither could I). Here’s one picture to demonstrate why. 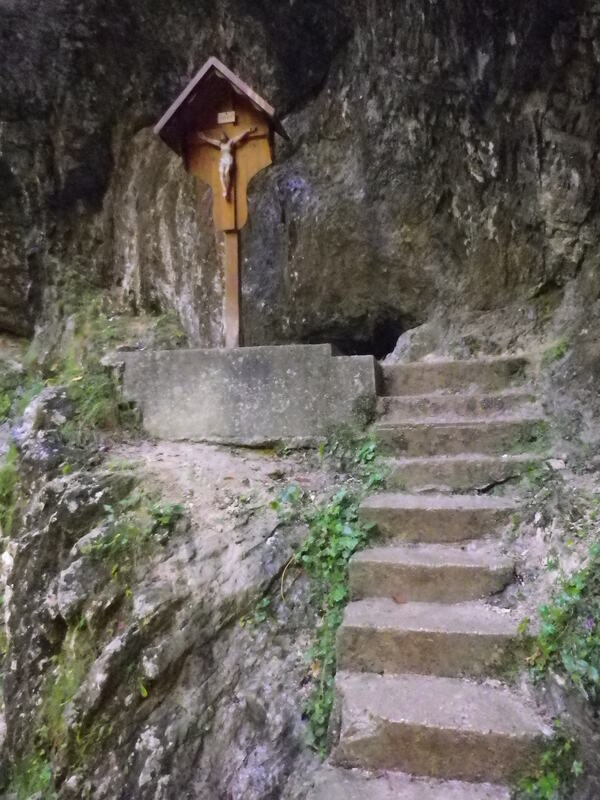 Shades of every cave novel you’ve ever read, especially The Lord of the Rings. 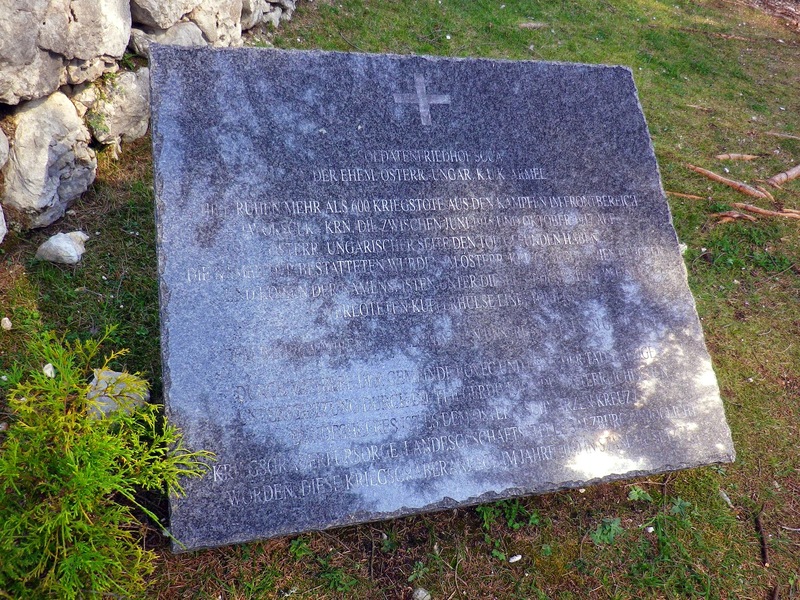 Though I also thought of The Perilous Gard and the weight that bothered Kate so much. Luckily, the ceilings here were high and we were unaffected. 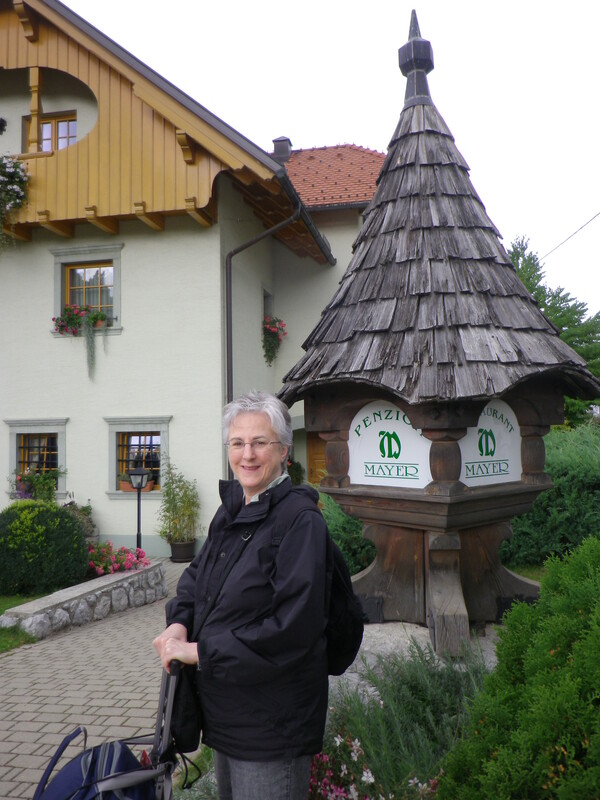 From here we drove to Predjama Castle, which Rick Steves says is notable only for its facade, so Alison dutifully took pictures while I slowly and carefully reversed the car in the crowded parking lot, and we were off. 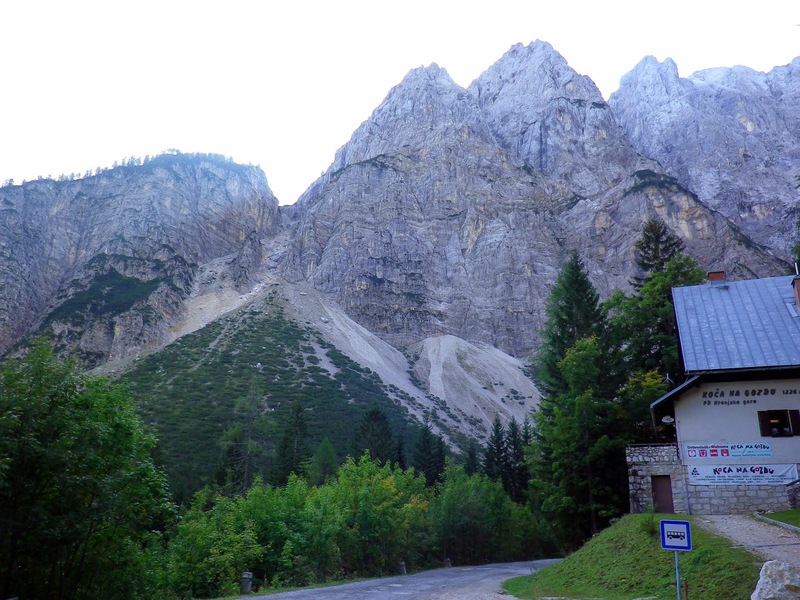 The trip to Postojna had been uneventful, divided highway all the way and most drivers courteous. The way back should have been the same, but it wasn’t. 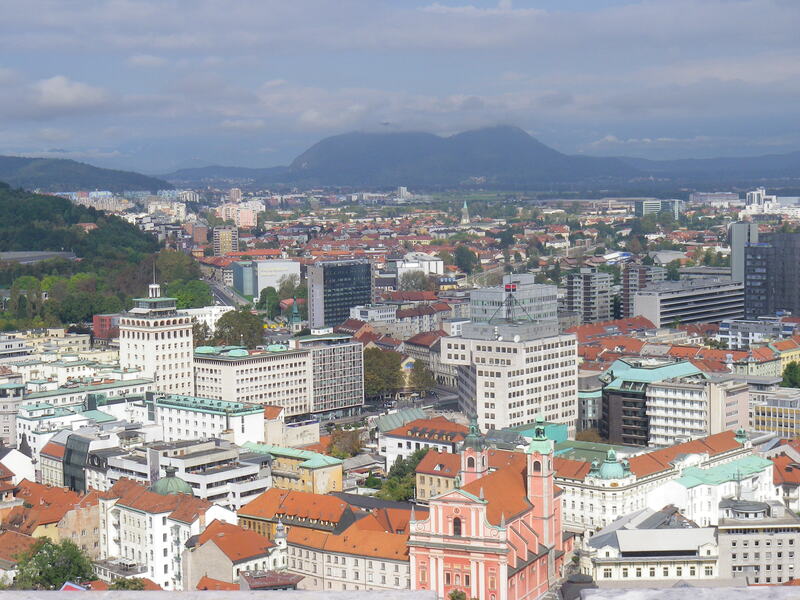 The exit for the highway towards Ljubljana, our direction, had a red line through Ljubljana. We were baffled, but since the truck ahead of us entered anyway, we followed. Shortly we realized that we had followed a road construction truck and that we were about to enter a lane closed to traffic because it was being repaved! All we could do was back up about 100 yards – no one else was foolish enough to enter – and ask the oblivious young woman at the booth how to get back to the highway. 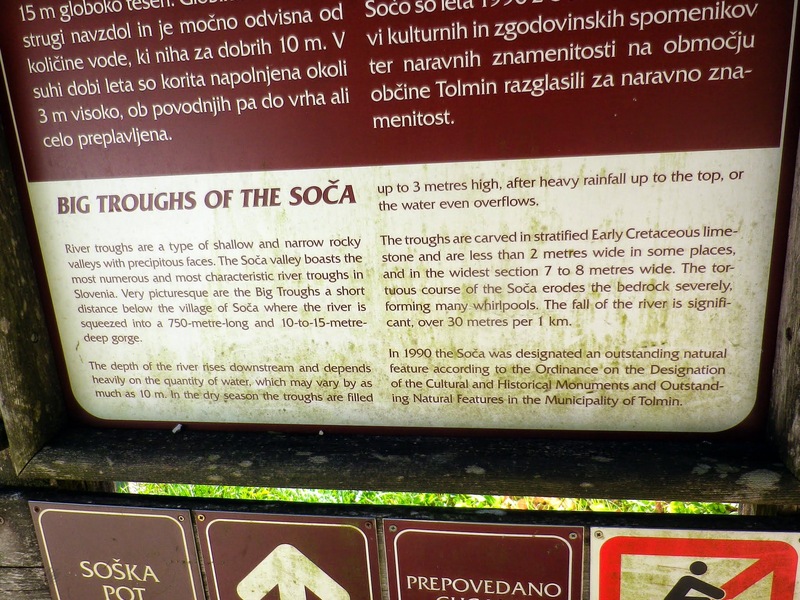 We had to ask a couple times, but finally took the correct turn and headed back through Postojna in the right direction. Or was it? We kept going and going, farther and farther with no highway in sight. At last I saw the green autostrada logo and made a turn. But was it right? 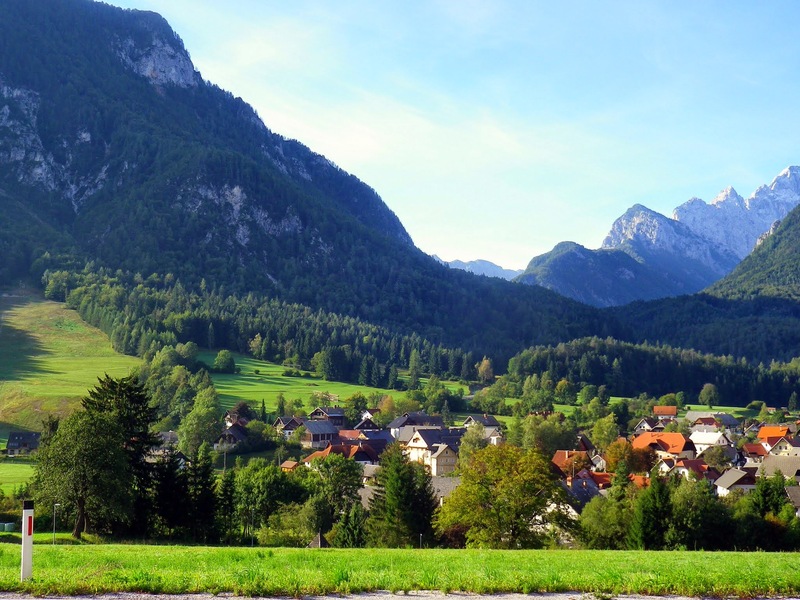 We drove through a tiny village in search of help and found a 12-year-old boy who tried to explain but finally called for his mother, who spoke Italian but no English. She very kindly told us he would get in the car and direct us, which he did, escaping a few seconds later at the village limits. But we continued on a narrow winding road for quite some time, wondering whether we had taken another wrong turn, until FINALLY we saw signs for the highway. Whew! Home to the Mayer and a glass of wine on the balcony, then an okay dinner in town. The young folks enjoyed a concert on the lake that woke us up at 1:00 am, but otherwise all was well. 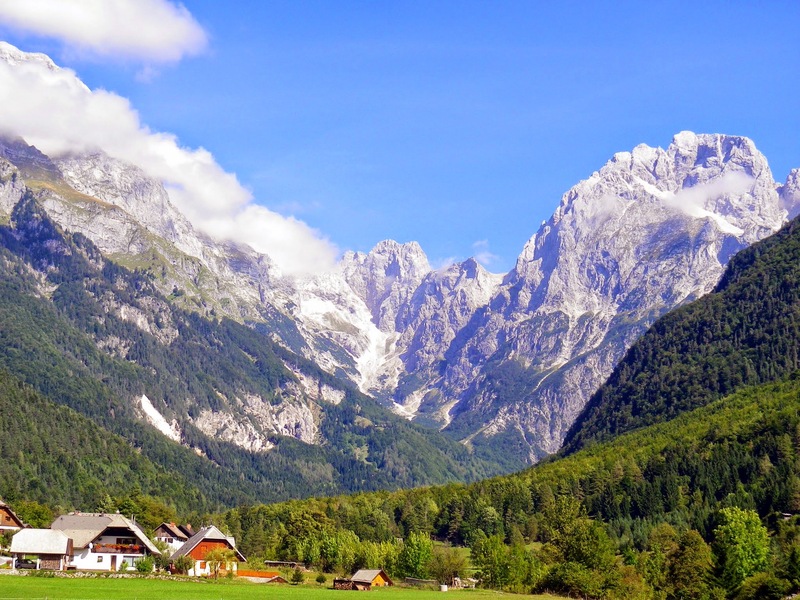 How to see the Alps without driving or hopping on a huge tour bus? 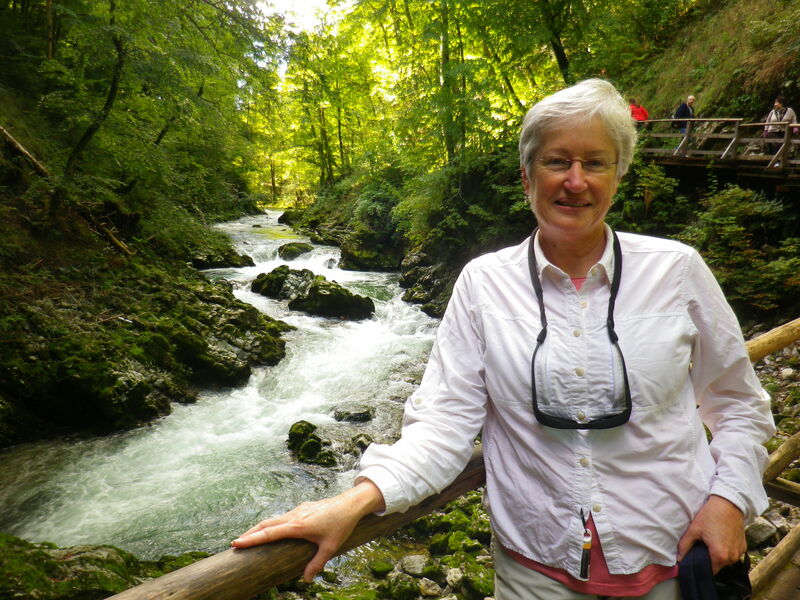 Book Tina, recommended by Rick Steves, for a day-long tour in her van. 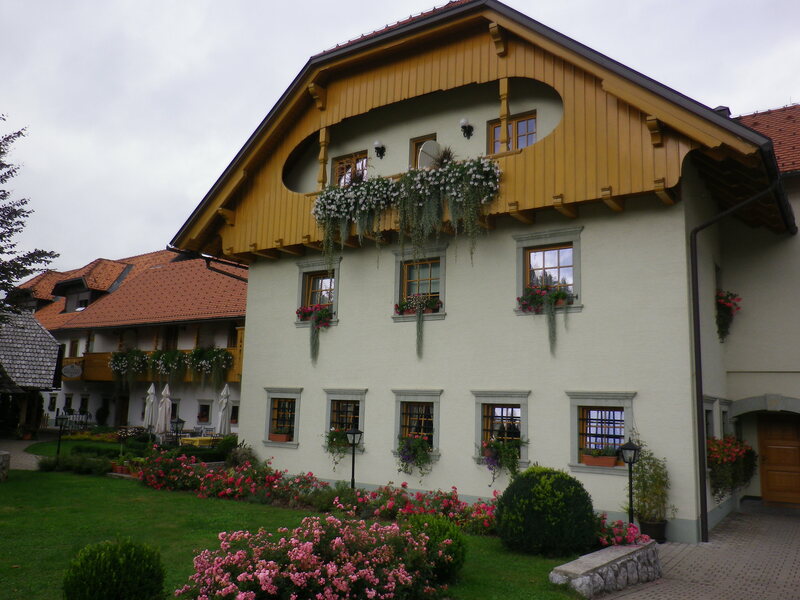 She picked us up at 8:00 and proceeded just a few minutes outside of Bled to a small village known for its 18th century beekeeper and the wonderful painted bee panels. 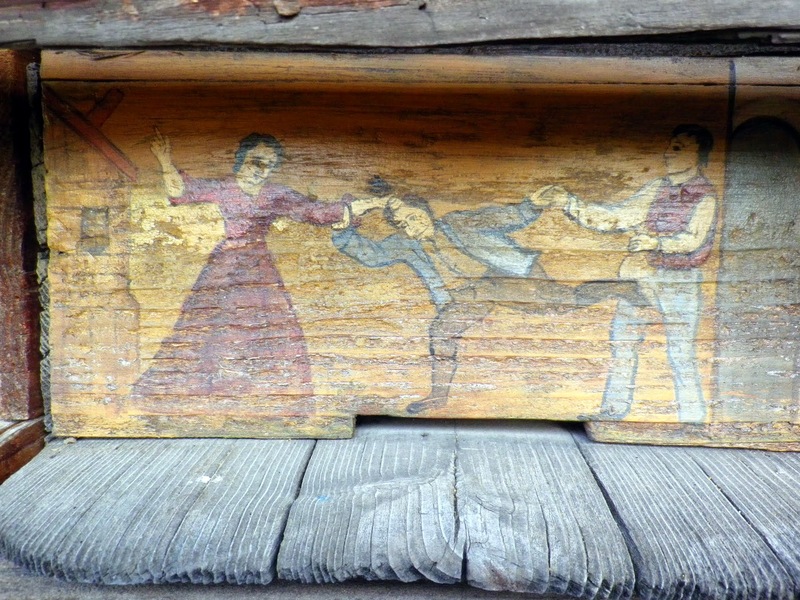 The pictures, meant to help the bees remember where home was, are based on Bible stories and folklore. 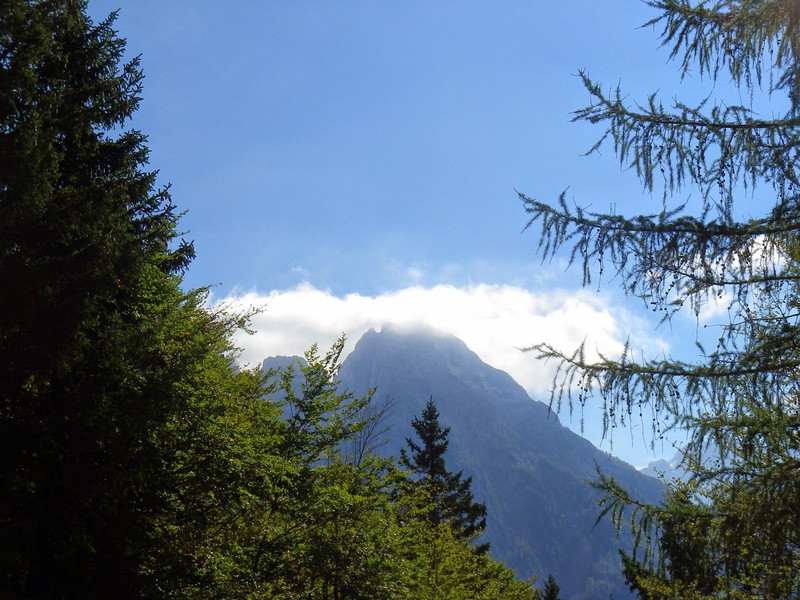 Soon enough we came to the first of many, many gorgeous views of the Alps. 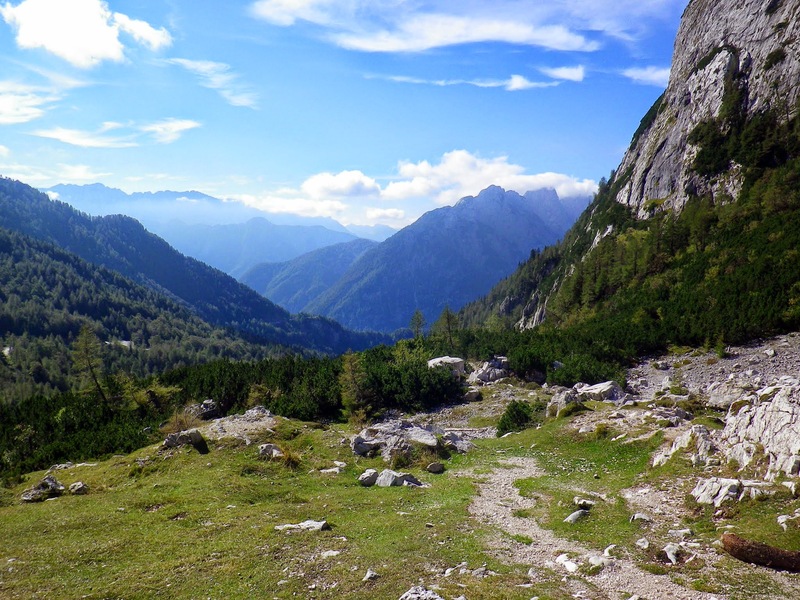 From here it was one wonderful view after another, first as we ascended the Russian Road, constructed by Russian prisoners of war during WWI, and consisting of 50 switchbacks. 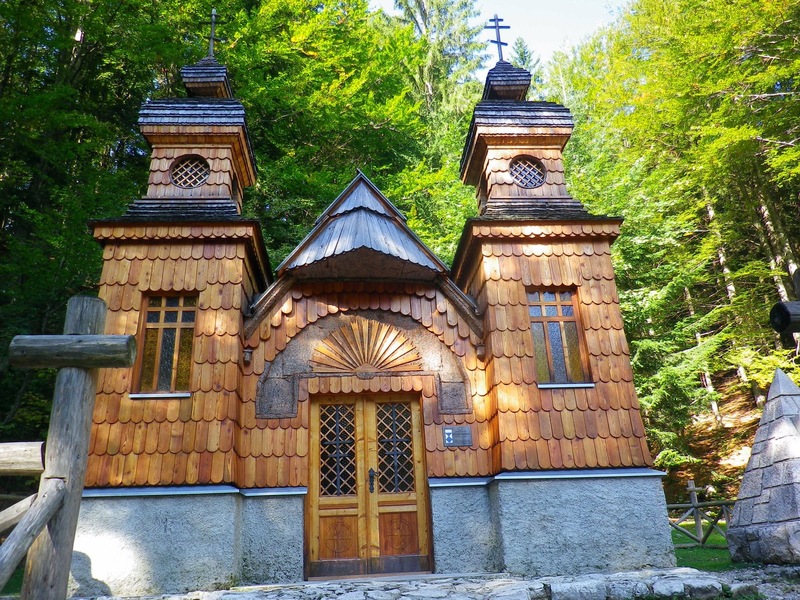 Partway up is the charming Russian chapel, chillingly constructed to commemorate the death of hundreds of Russian POWs in an avalanche in 1916 (?). 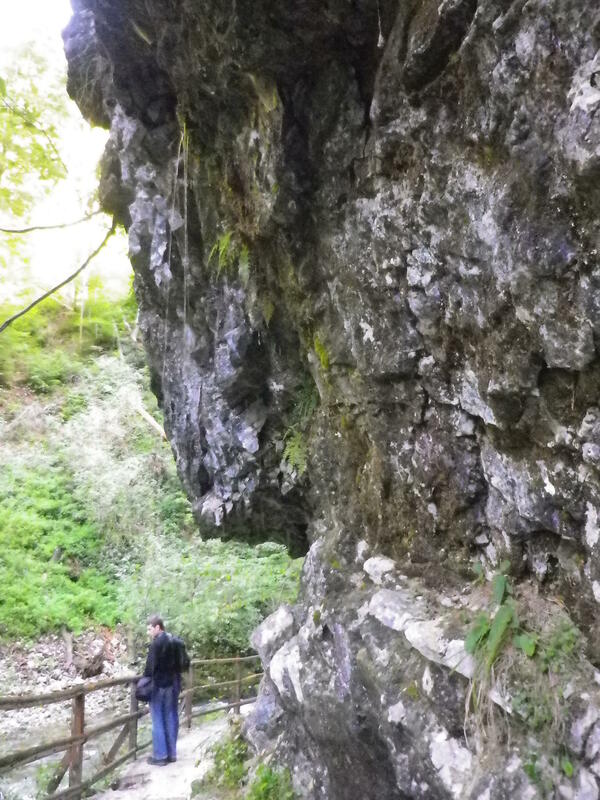 On the way up, we stopped here for coffee, and Tina pointed out the amazing rock formations. Here are some words about the so-called Front Window. 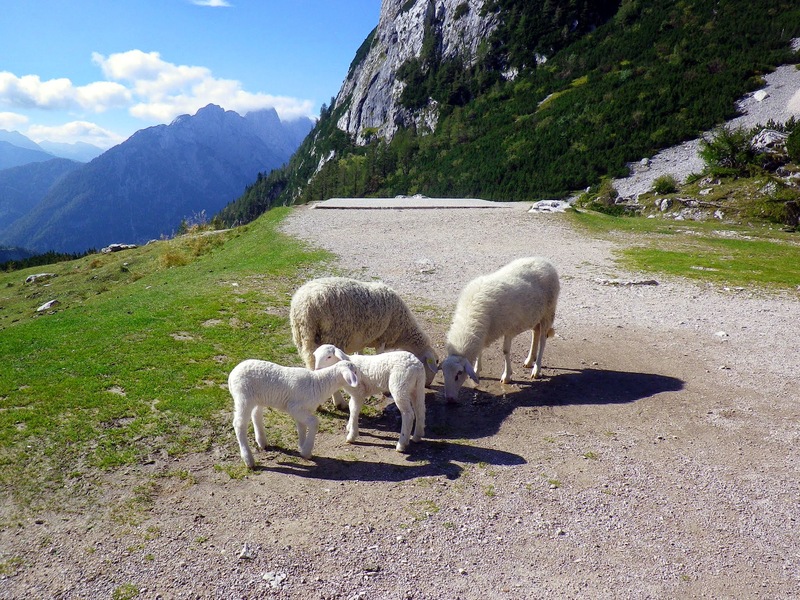 At the top of the pass, we found a number of sheep bleating piteously at the tourists. Tina offered us both a sip of blueberry brandy from a little leather case where she stored tiny metal stirrup cups. 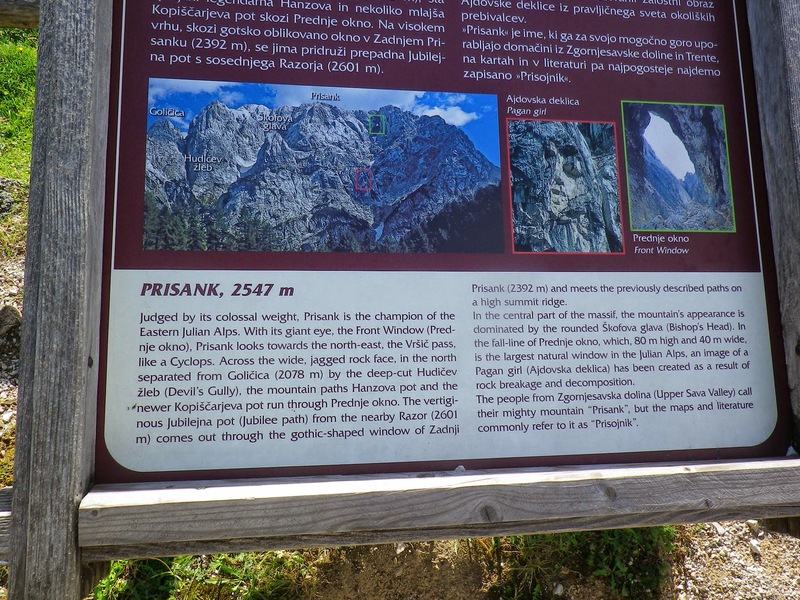 If you can’t be Slovene until you climb Mt. 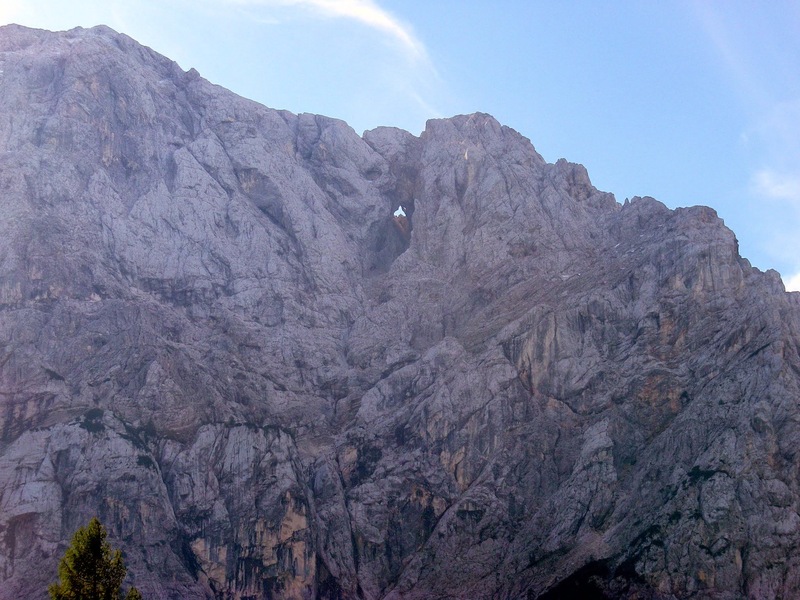 Triglav (she’s climbed it three times), then you can’t say you’ve been to the mountains until you’ve sipped brandy at the top. 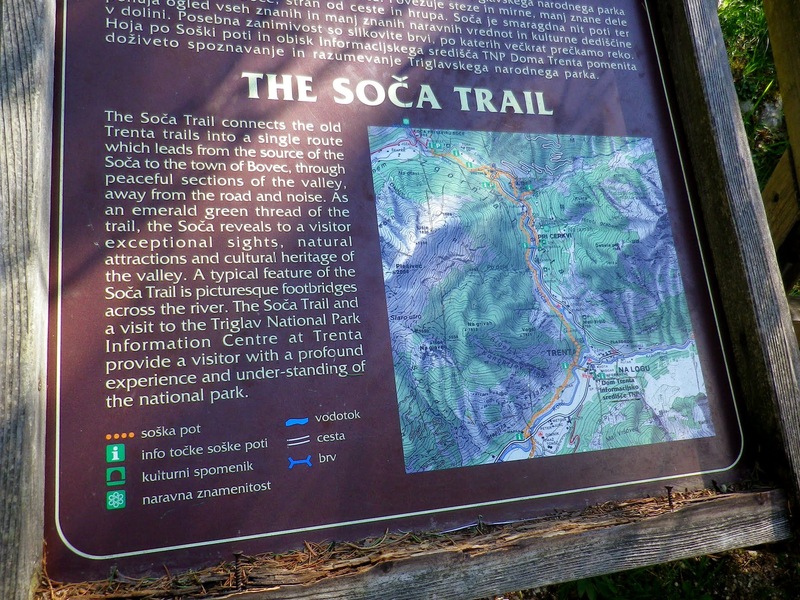 From here we could see two valleys, the Trenta and the Soca, one carved out by a glacier and the other by a river. 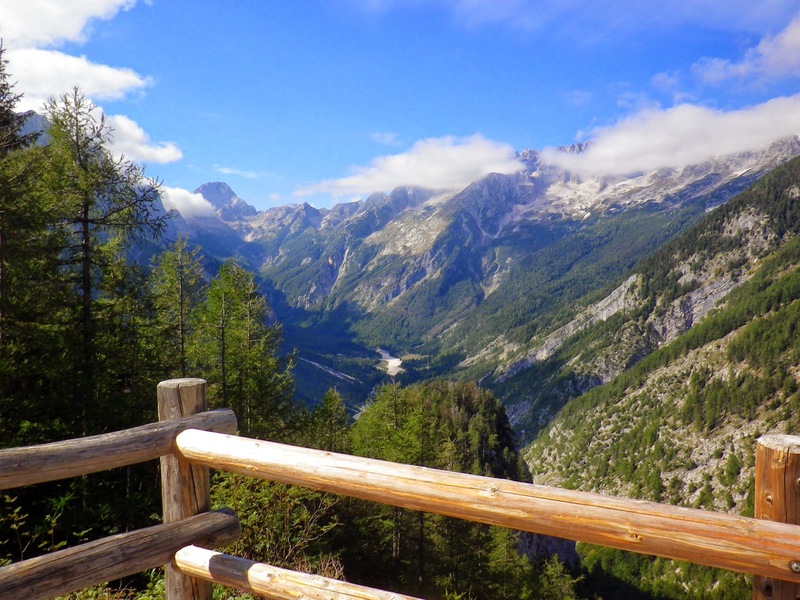 The views continued to be spectacular as we wended our way back down. 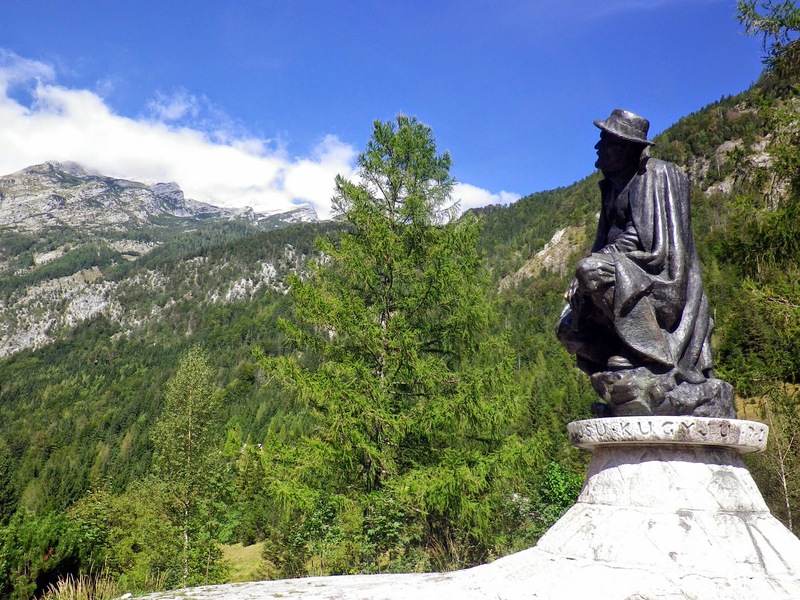 We stopped for our picnic by a statue of the man who most loved these mountains. and then from little byways which we would never have found on our own. This was one of the most impressive. 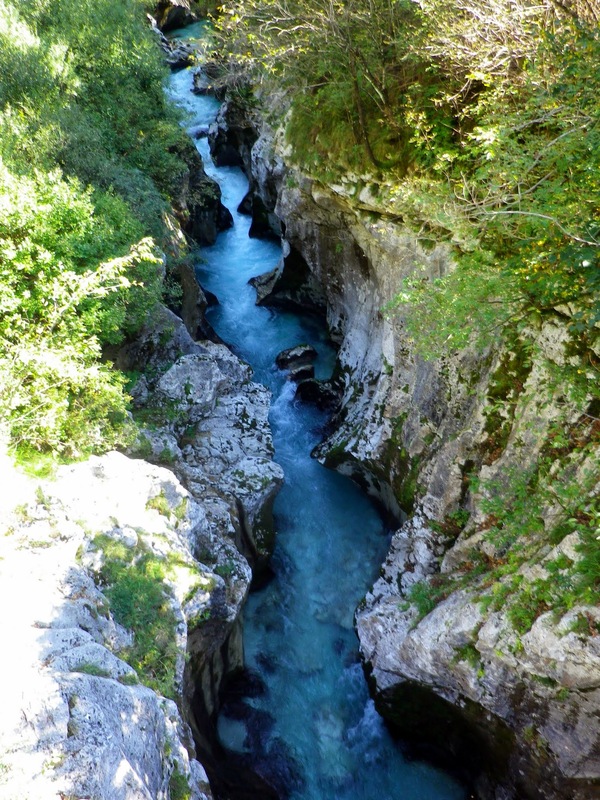 Here are some words about these so-called river troughs. We returned via another pass, not so dramatic but beautiful all the same. 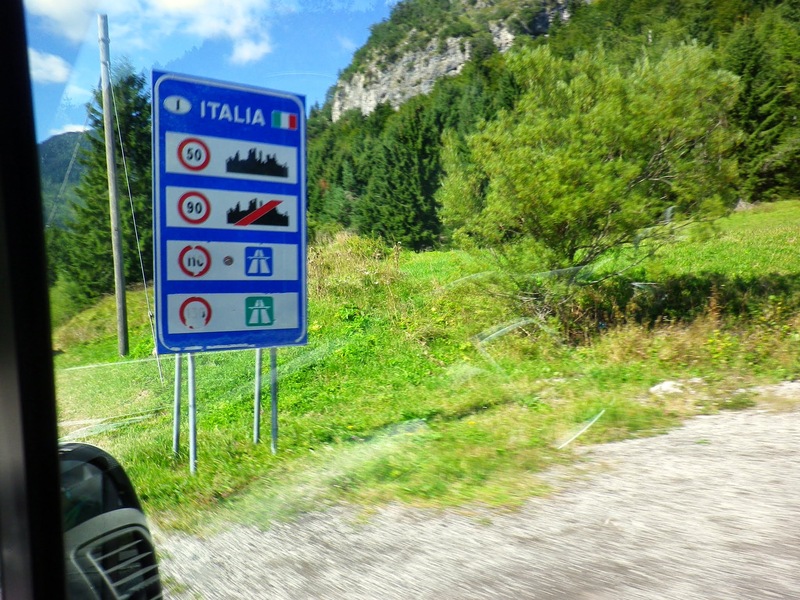 In the course of this part of the trip, we visited Italy for about 20 minutes, without ever needing to show a passport. 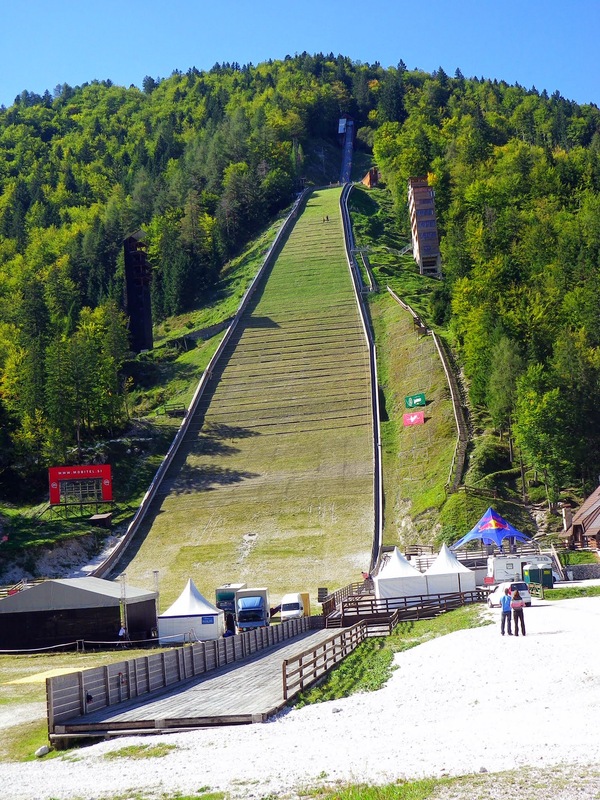 We came back into Slovenia to see the world’s highest ski-jump, a terrifying sight, which was to be the site the next day of a run up and down the jump. I can hardly imagine! Tina dropped us off at the Mayer after a day that was exhausting but unforgettable. Brilliant skies, good and informative guiding, and a resolve to return again one day. Getting here is never much fun, this time highlighted by ferocious thunderstorms on the way to Dulles and a tight connection in Frankfurt that had us racing through the airport, panting all the way, but we – and our luggage -made it with minutes to spare. 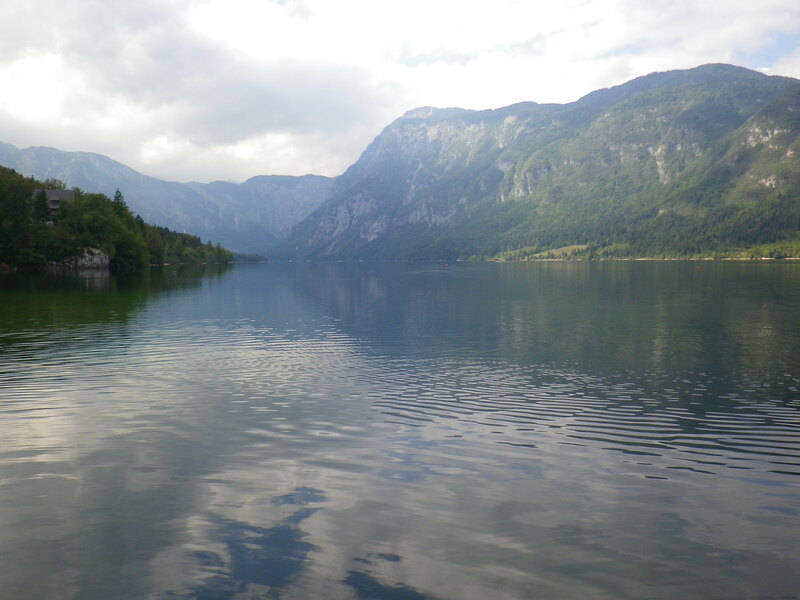 Our driver from Ljulbjana to Bled got us here quickly, despite texting all the way. The Penzion Mayer is lovely. 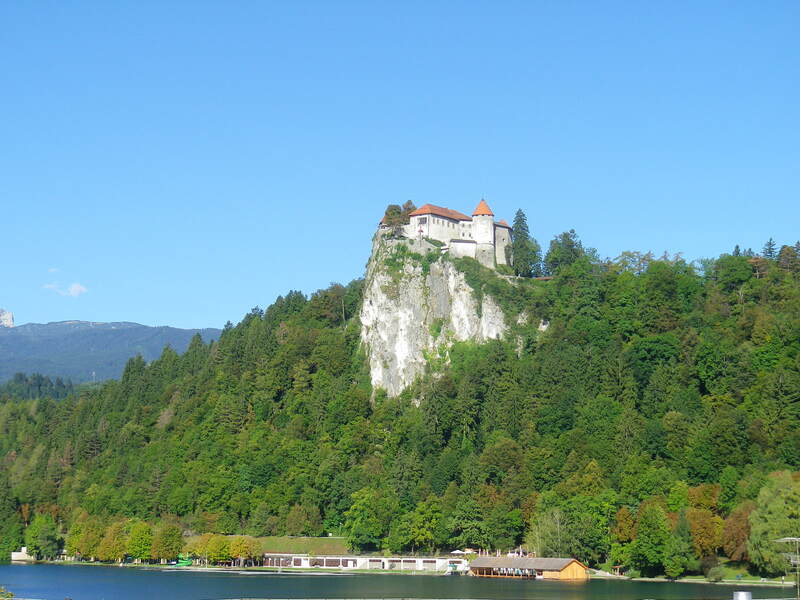 Our room has a tiny balcony that looks out on to Bled Castle high above the lake. After a much needed nap, we spent more than half an hour on my phone trying to get Alison’s phone enabled to place as well as receive calls. No luck, though the Verizon rep promised she would keep working on it. Luckily, it was pouring down rain and we were exhausted, so it was really the best way we could have spent our time. 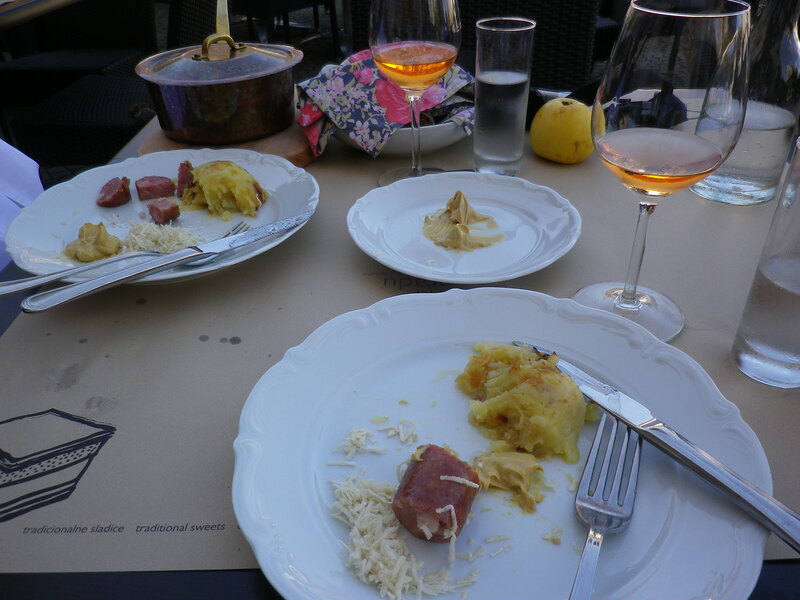 The technology will drive you crazy if you let it… An early dinner in the hotel – venison, wild boar, and very Central European dumplings – hit the spot. And so to bed for almost twelve hours. We awoke this morning to clouds that quickly dissipated to reveal sparkling sunshine and a fresh breeze, a real Sunapee day. 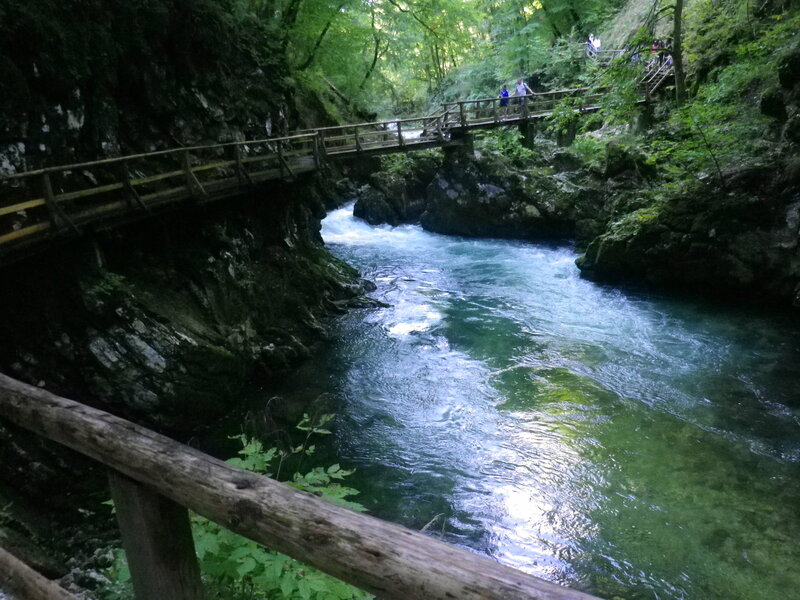 While Alison went to the bank and the grocery store (really), I took the tourist bus to Vintgar Gorge, a half-hour ride through small villages and up and down switchbacks to Bled Castle and so to the gorge. And it was gorgeous! 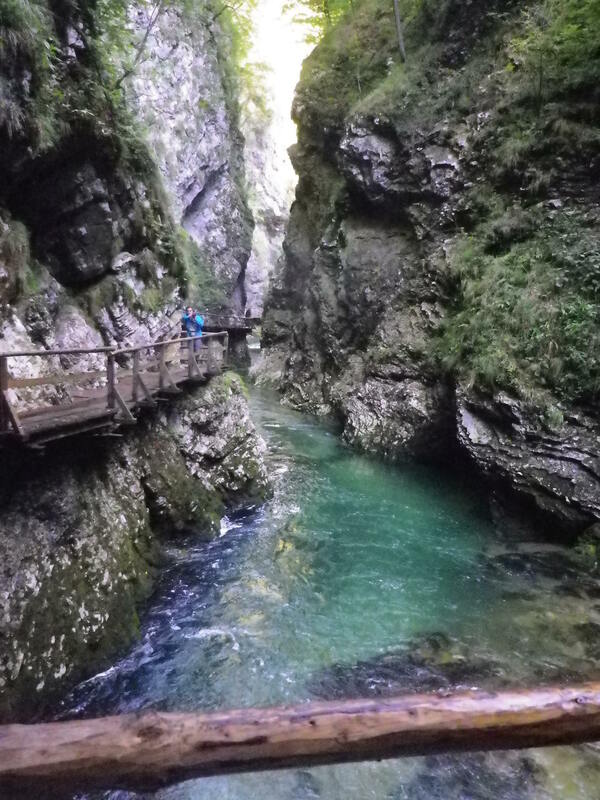 I had been a little concerned about the high bridges and narrow path, but it was so beautiful and easy to navigate that the height didn’t bother me much at all. 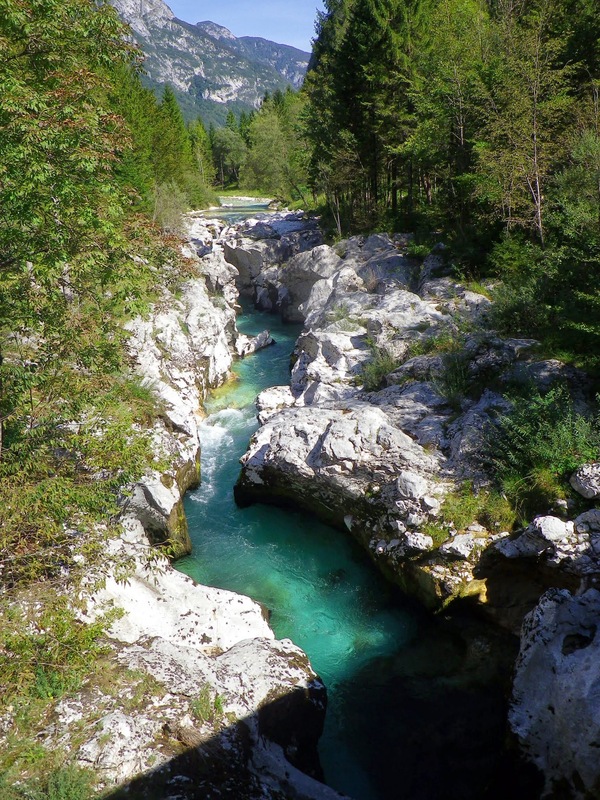 The Vintgar river roared down a narrow way with steep cliffs on either side, or proceeded placidly down stream, revealing its clear green water above a sandy, rocky bottom. Building the trail must have been rare fun – wooden walkways directly over the water, multiple bridges, back and forth for almost two miles. It was so beautiful that you just have to look at the pictures. 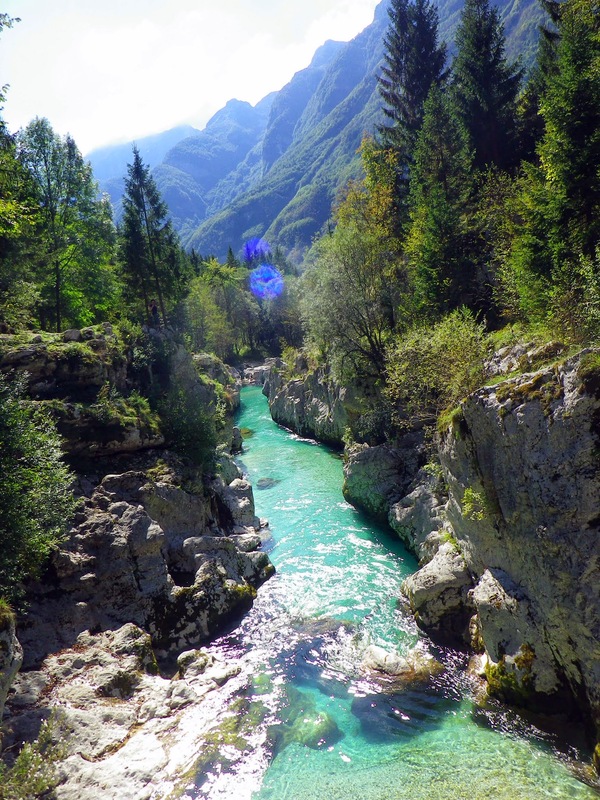 At the end of the trail (though I could have continued through the mountains) there was a beautiful view of the river and the alps. 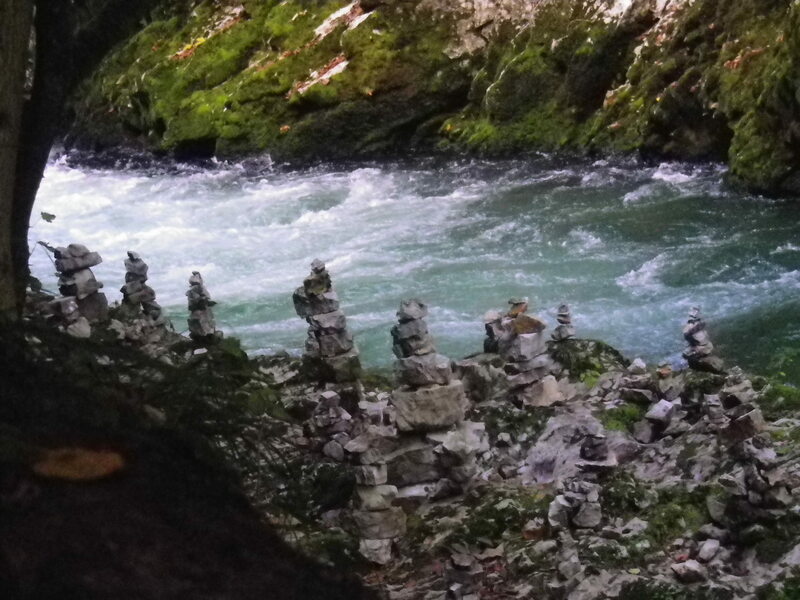 On the way back, I noticed all the cairns along the river bank and added my stone to one of them. Thanks to the couple from northern Virginia who took my picture! 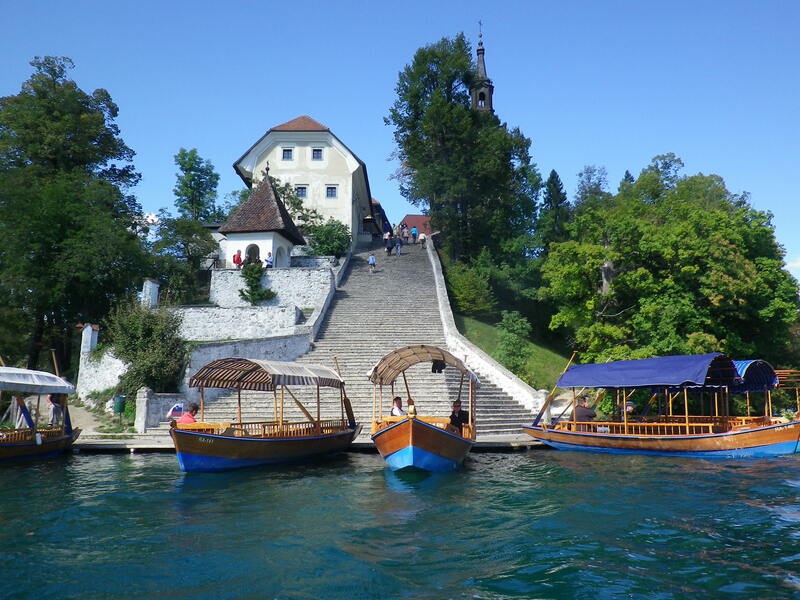 Alison and I met for lunch, then wandered down to the lakeside to get a pletna (rowboat) to the island. 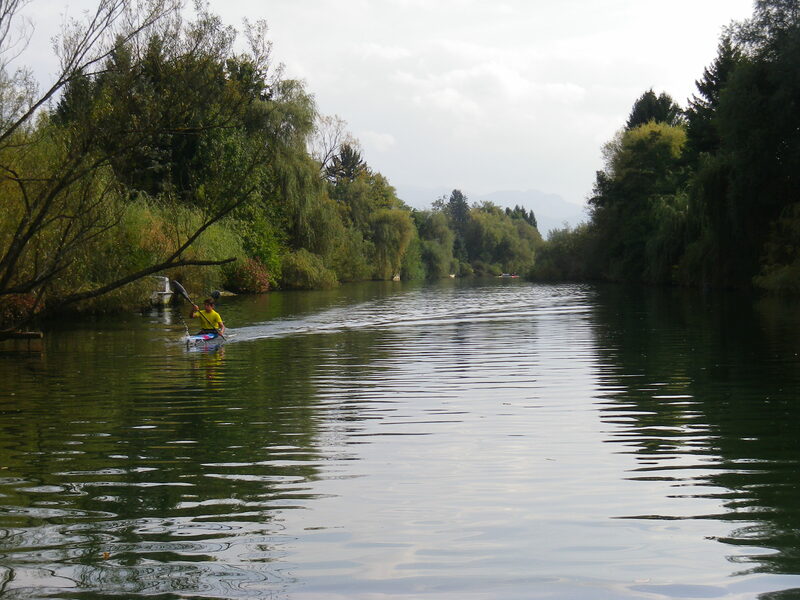 The rowers wait until a boat is full, then set off across the lake at a leisurely pace – though they still get a good workout. The church on the island is so photogenic that we both had to take dozens of pictures, of which this is the best. 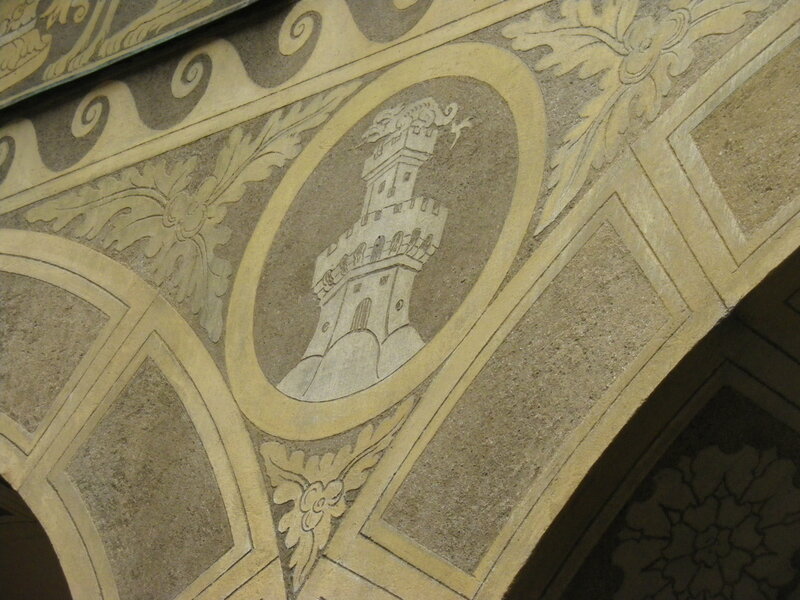 Arriving at the island, we climbed the 99 steps – shades of the Tuscan hill towns! – up to the church. 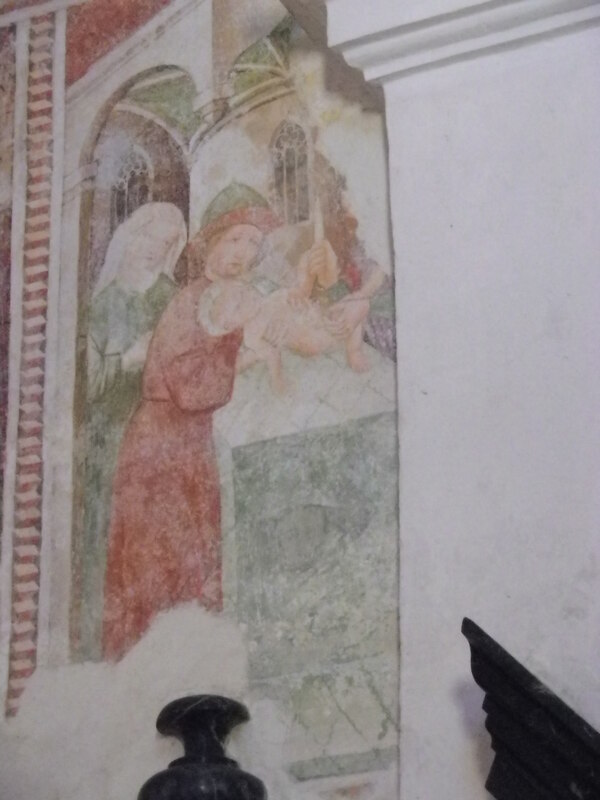 Inside are baroque altars and the remains of older frescoes depicting the life of Jesus, complete with his bris. The tradition is that you ring the bell three times, if you can do it, and get your wish. Alison named this the Crossfit challenge, so of course I had to jump with all my strength to show my strength. A quick stop at the gift shop and we had exhausted the pleasures of the island. 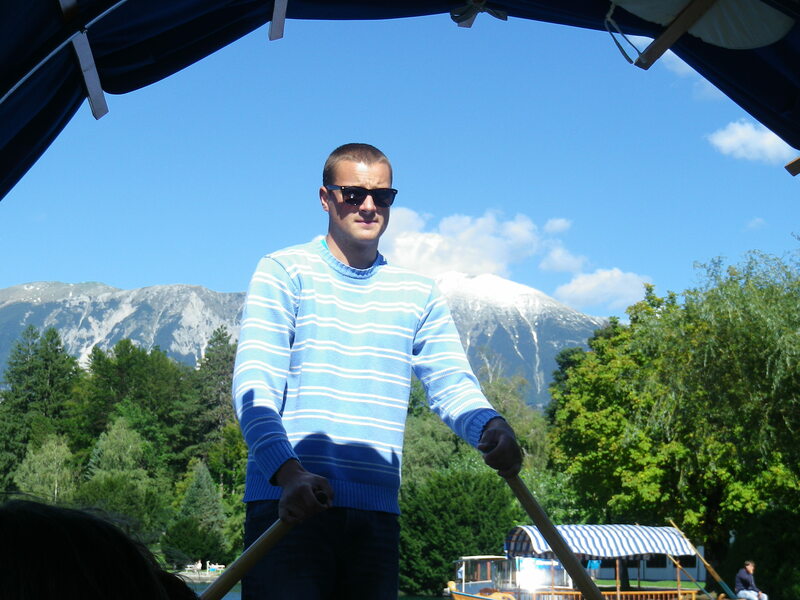 We took a different boat back so that we could, at Rick Steves’s suggestion, visit the former villa of Marshal Tito. 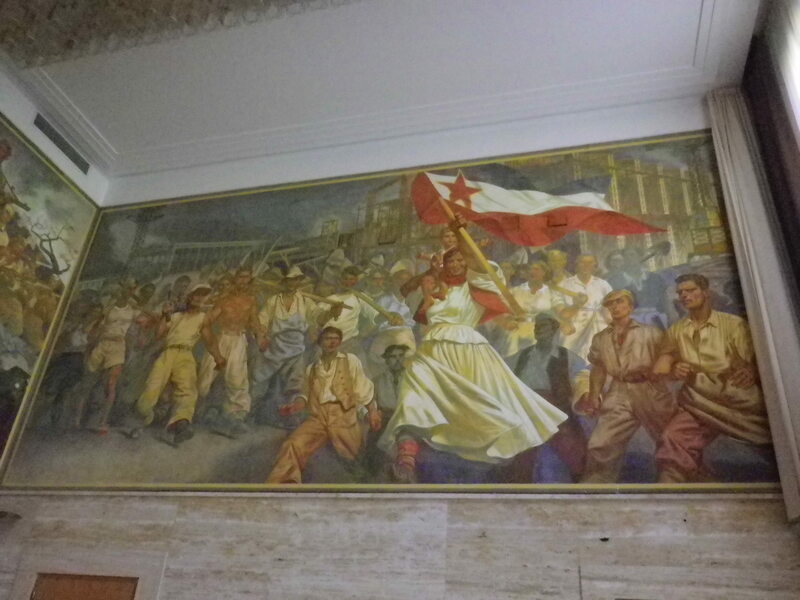 It’s been a hotel since 1984 and it’s hard to tell how different it might have looked back in the good old days of Yugoslavian communism, but for one feature: the Soviet Realist style murals that have been carefully preserved in an otherwise empty room on the second floor. 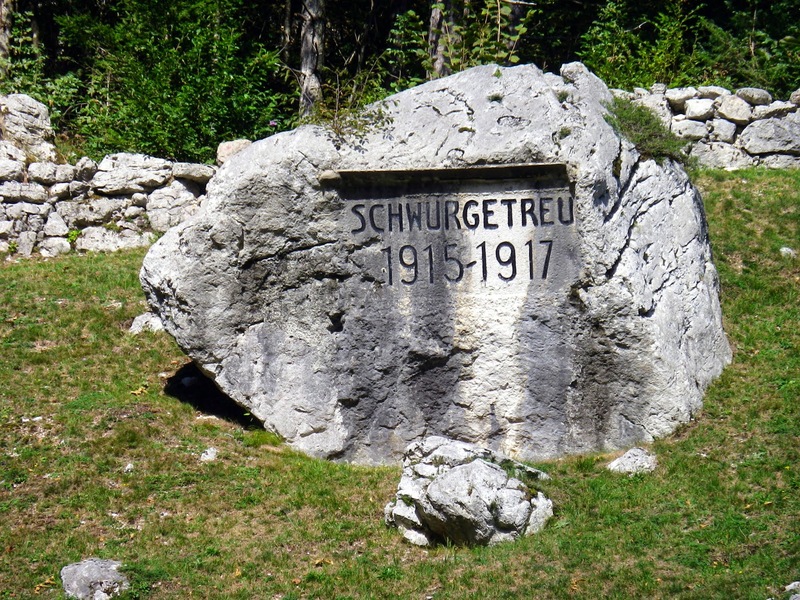 We enjoyed this view of the Partisans conquering the Nazis, although as I recently read (in Jan Morris’s Trieste book? 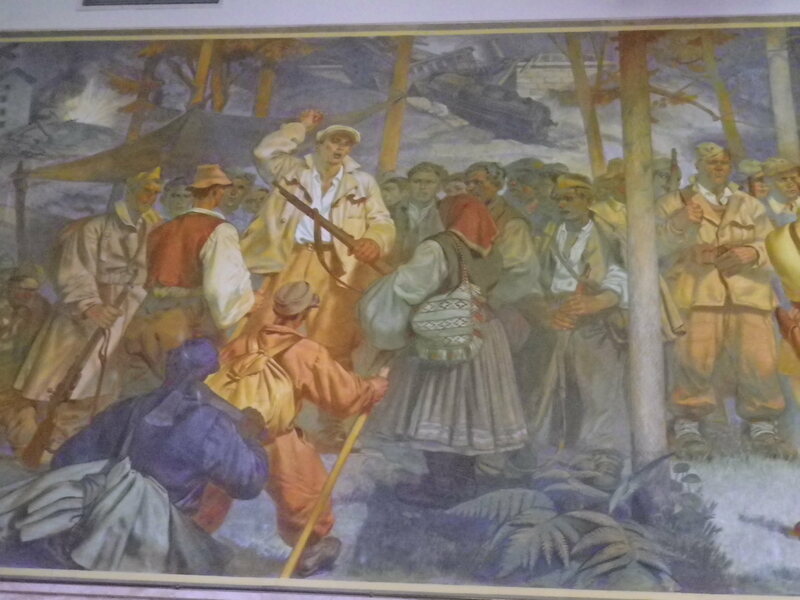 ), they were no kinder to their Yugoslav enemies when the time came… Here are Tito conquering the Nazis, and the triumph of Communism, complete with farmer and factory worker walking hand in hand and the vigorous mother and child waving the flag. 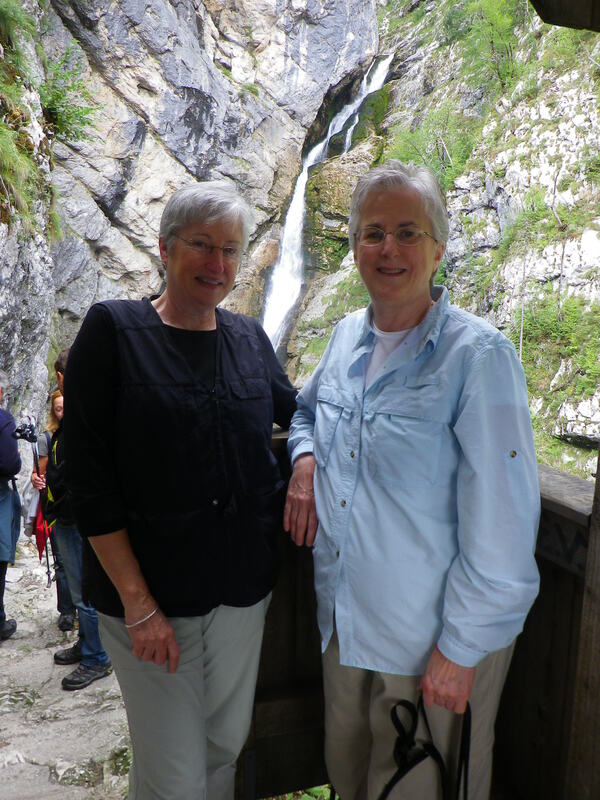 We strolled in a leisurely way back around the lake to Bled, enjoying the mute swans and the incredible views of the castle and the Julian alps, barely covered in snow at the very top. Then back to the room for a rest before dinner.